Hey good lookin'. Whatcha got cookin'?... what's that? You say, "A hidden-object game that isn't a well known and established series but isn't mediocre?" Echoes of the Past: Royal House of Stone is a fun first chapter in a new series that may be small in scope, but has a heart as big as a whale. Or, uh, something. The story, which I would call "like Princess Isabella, but... " begins with you touring a museum that features an exhibit on an ancient medieval family that met with strange and unfortunate circumstances. Upon examining a portrait of the prince, who vanished on the eve of his coronation, you find yourself getting dizzy... and wake up in a darkened room... apparently hundreds of years in the past. How are you going to get home? Who was that mysterious woman? What happened to the inhabitants of the castle? And more importantly, I don't think cappuccinos were invented until after the twentieth century!! Clearly you need to unravel the mystery, post-haste. 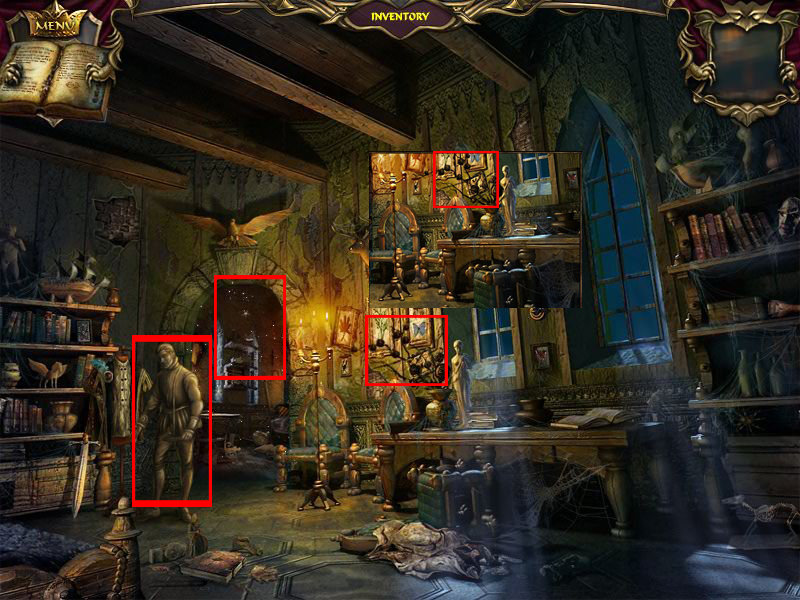 If you're a regular visitor to this site, you're probably familiar with the controls for a hidden object game. But just in case these intricacies are new to you, let me help you with them; there are none. Intricacies, that is. You navigate by clicking your way around the screen. 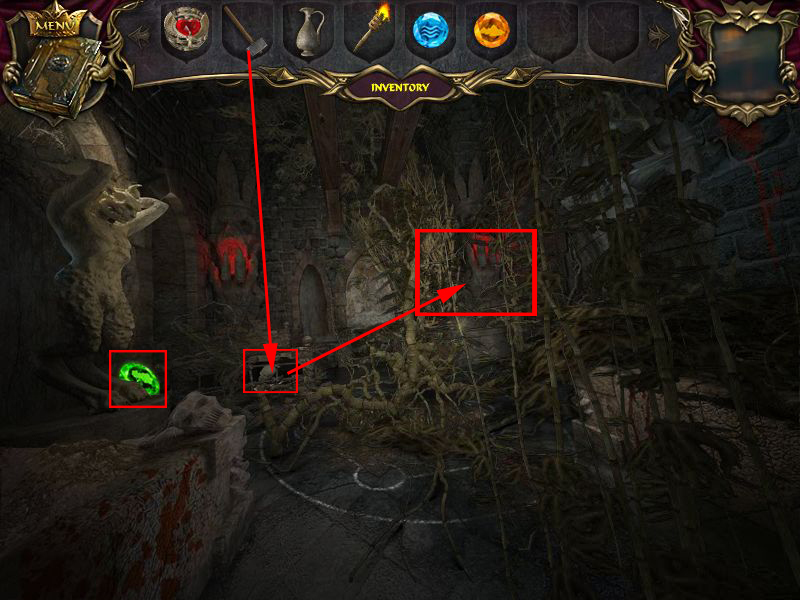 If the cursor changes to an arrow, clicking that area will move you to a new location. If the cursor changes to a magnifying glass, you can click on that spot for a closer look. Cursor changes to a hand? You can interact with something. 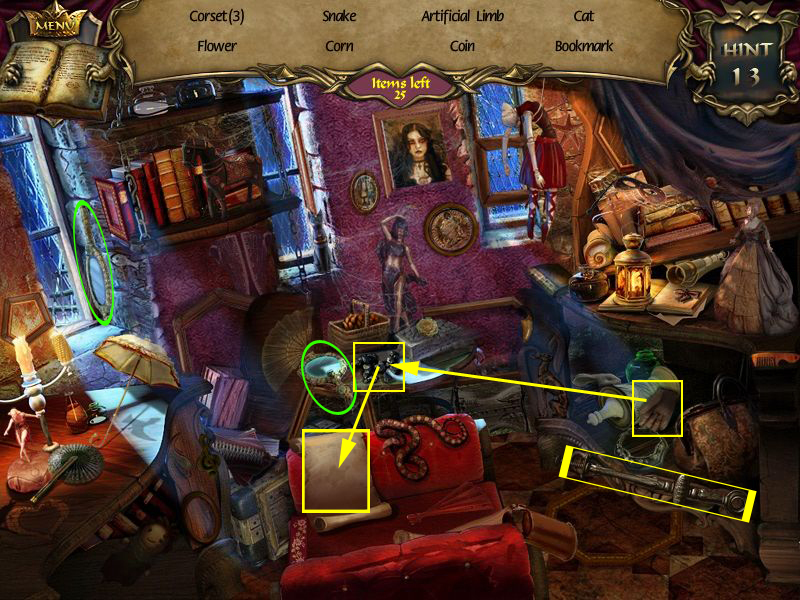 And if you see sparkling on the screen, click on it to trigger a hidden object scene. 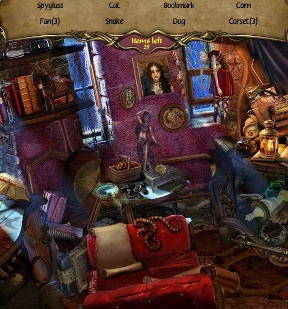 Royal House of Stone also flirts with the point-and-click genre, having you collect items you'll need to complete puzzles. Find yourself getting stumped? 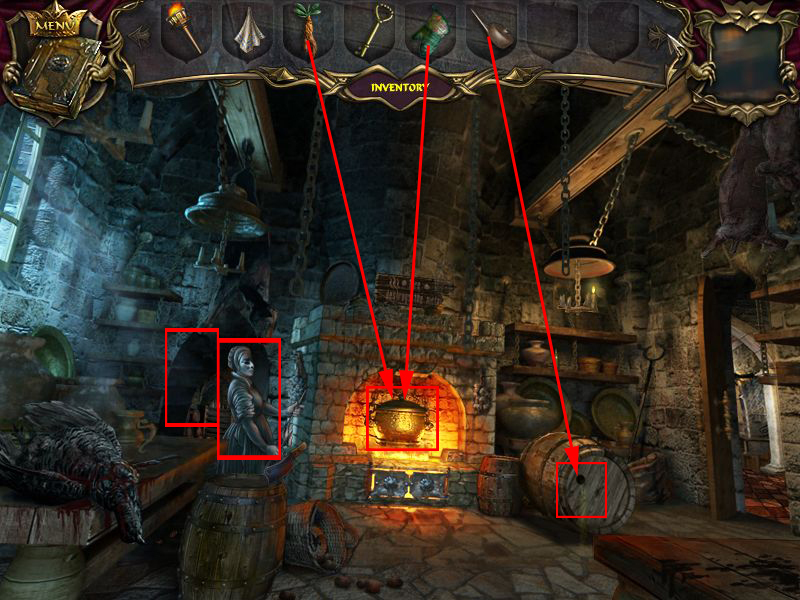 Don't worry, as your handy-dandy magic mirror (yes, really) is there to provide hints and clues, as long as you keep finding other mirrors in hidden object scenes. 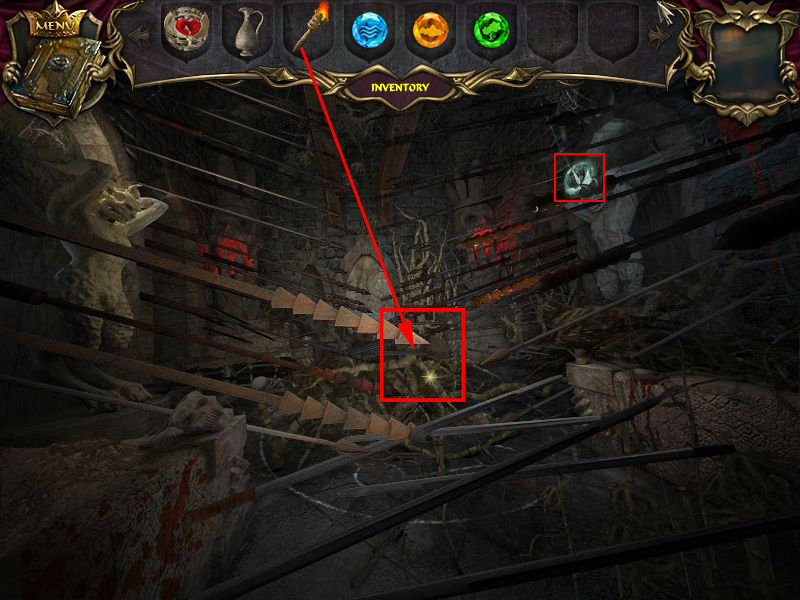 Add in the fact that you can skip most (but not all) puzzles simply by waiting around a bit and then hitting the big ol' "skip" button in the upper right corner and the game is accessible to pretty much anyone. It doesn't hurt that Royal House of Stone is a handsome little HOG if ever their was one, either. The environments are lovely, with lots of little touches, like the spiders that scurry past you, and the strange things you'll never quite be sure you actually did see out of the corner of your eye. No slouch, either, the audio, with an atmospheric soundtrack and voice-actors who, by and large, are surprisingly inoffensive to your tender ears. I just wish the story had kept up that same level of quality. No, it's not "Ayn Rand" bad, thank goodness, but... Tragedy befalls kingdom and only one lone adventurer can lift the curse? Been there, read that, seen the Disney film adaptation. Analysis: I'd imagine that a hidden object game is pretty easy to make, since the market seems to be sopping with them these days, but it seems to be hard to make well. 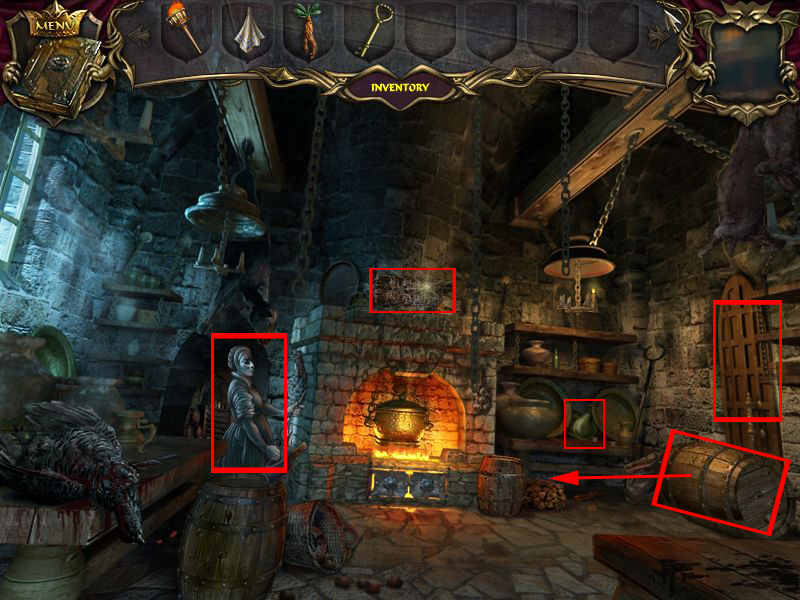 With the exception of the Mystery Case Files series and a few other titles, any time I usually spend with a hidden object game is time steeped in boredom and resentment, like some foul yet mediocre blend of tea. I'm not saying Royal House of Stone is revolutionary and is going to change your life. It's just a game that manages to avoid most of the pitfalls other games in the same genre fall into, such as poor object design, bad translation, pointless to-and-fro-ing, and the like. Which, you know, helps to take some of the sting out of the unreasonable item requirements that are a staple of the point-and-click genre. At one point, for example, you need to gather some seeds. Not particularly ominous seeds, mind you. Just seeds. But you can't just pick them up and put them in your pocket, oh no. Nor can you put them in any of the items in your inventory that could be used to hold anything or simply bundle them up in a bit of rag that's lying right freaking there. You have to find a special bag to carry these seeds. Not that there appears to be anything special about it. If you've played a point-and-click game before, you're probably used to this sort of "because I said so" school of restriction, but it's still a bit ridiculous. Thankfully, if "no, only this item will do the job" is standard, the puzzles here are not. While you've got your share of tasks that need to be solved by using the appropriate item in the appropriate, obviously marked location, that's not the only solving you'll do. 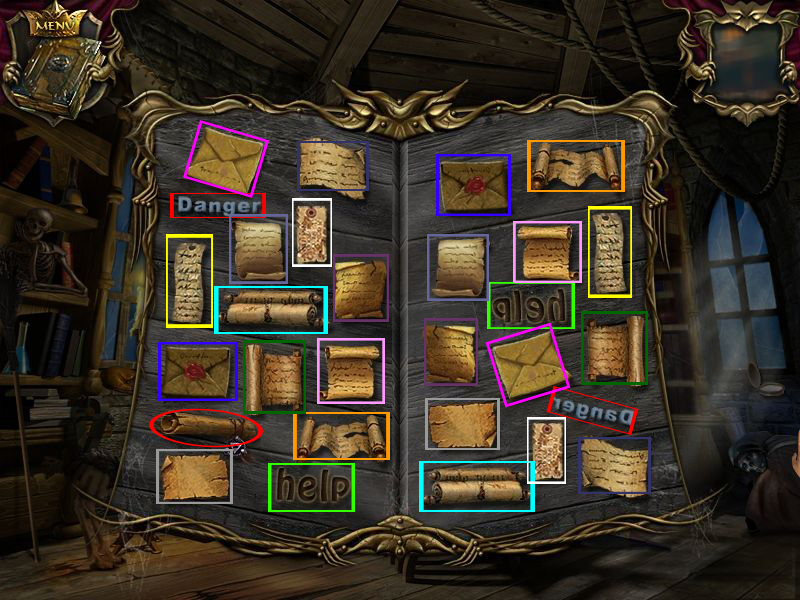 A goodly portion of the game's puzzles actually require logic. 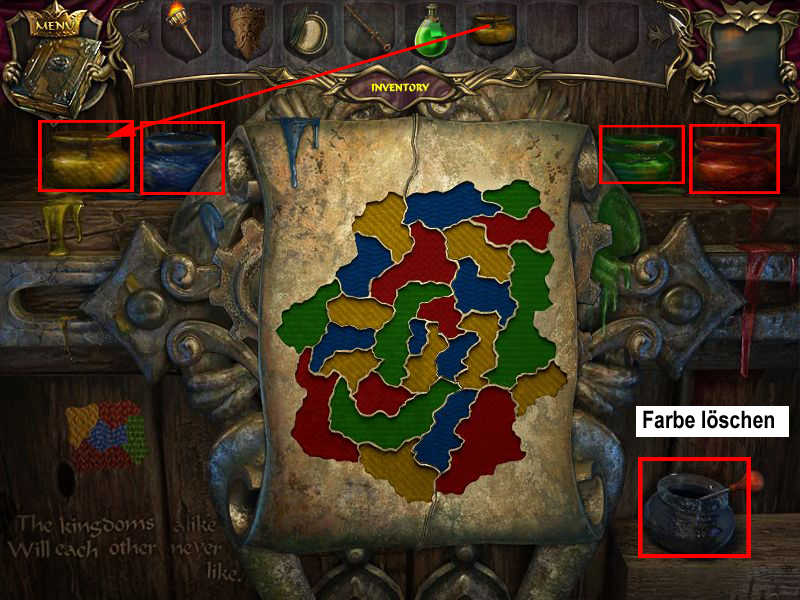 One puzzle, for example, requires you to paint sections of a map representing a feuding kingdom, and to keep identical colours from sharing the same border. Another has you use a series of weights to trigger a mechanism. None of them really qualify as brain busters, or are even terribly unique, but it's still nice to have a game treat me like I'm capable of basic function beyond knowing not to try to fit my whole fist into my mouth. Thanks for always believing in me, Royal House of Stone. But the biggest flaw? The length. Royal House of Stone feels about half as long as it really should be, and most players will probably breeze through in a matter of hours. Whether you find this a Misery-esque fatal hobbling depends largely on how much game time you demand for your buck. 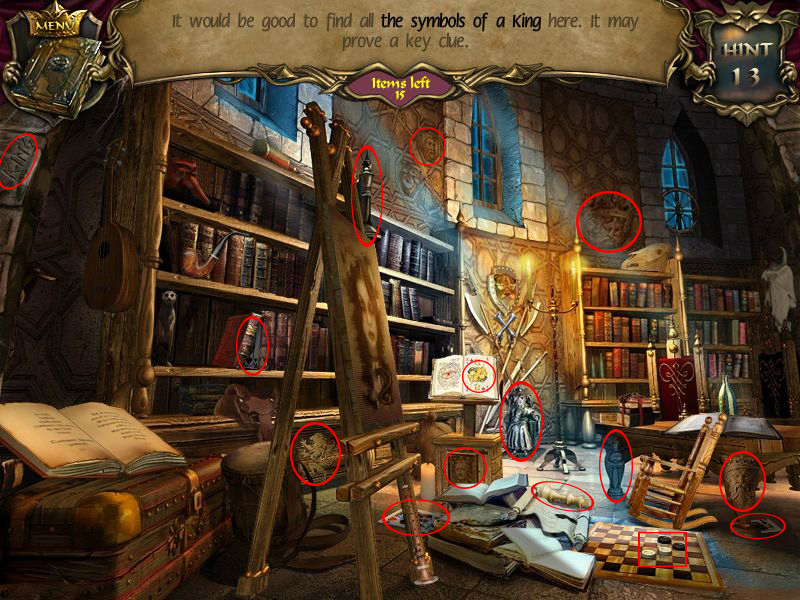 Royal House of Stone is high quality, entertaining, and worth a look if hidden objects are your "thing". If quality over quantity is what you're looking for, then you won't be disappointed here. Echoes of the Past: <br />Royal House of Stone Walkthrough now available! 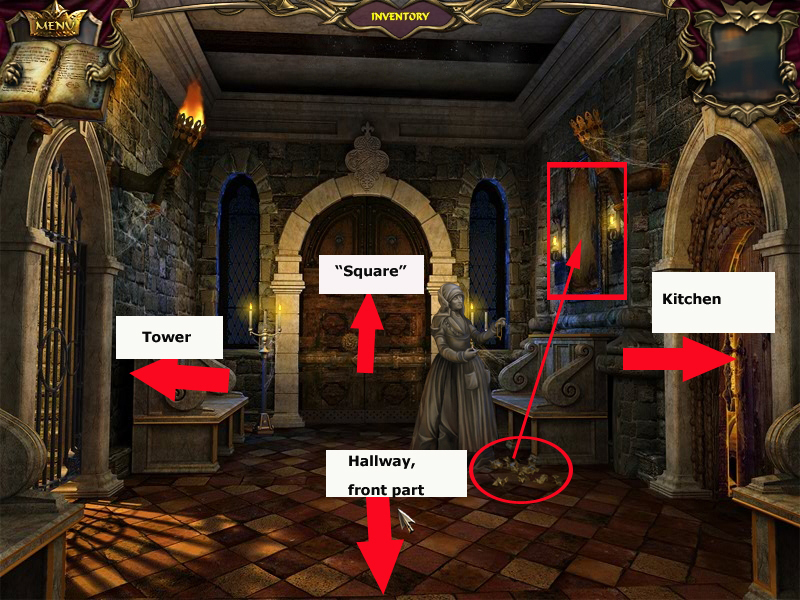 Ho-scenes are random except objects you need for a mini-game, mirrors and inventory objects. You will find ho-scenes by clicking on sparkling areas. When your mouse cursor turns into a hand you can pick up an object. When your mouse cursor turns into a finger you can touch objects. A magnifier at the mouse cursor indicates a nearby view. 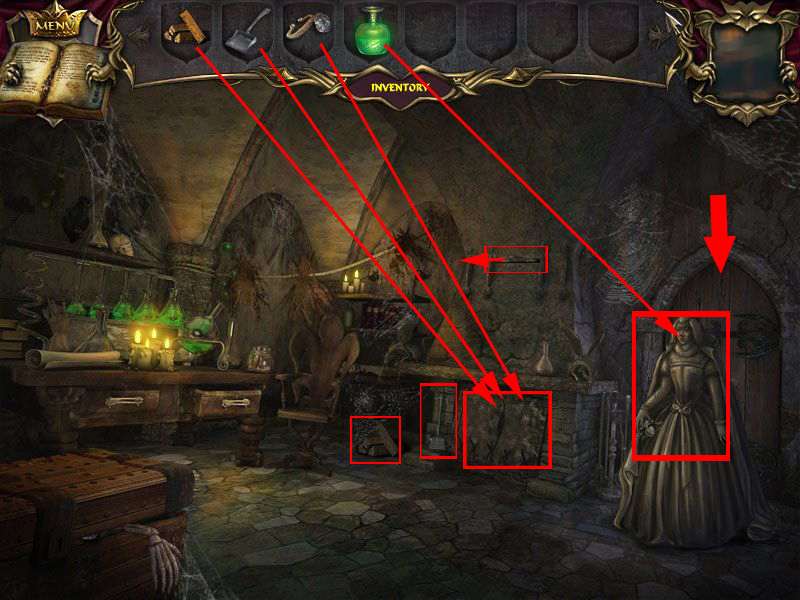 You will find your inventory on top of the screen, it will open when you hoover over it with the mouse. Arrows show you where you can go, click the arrow to go into this direction/room. 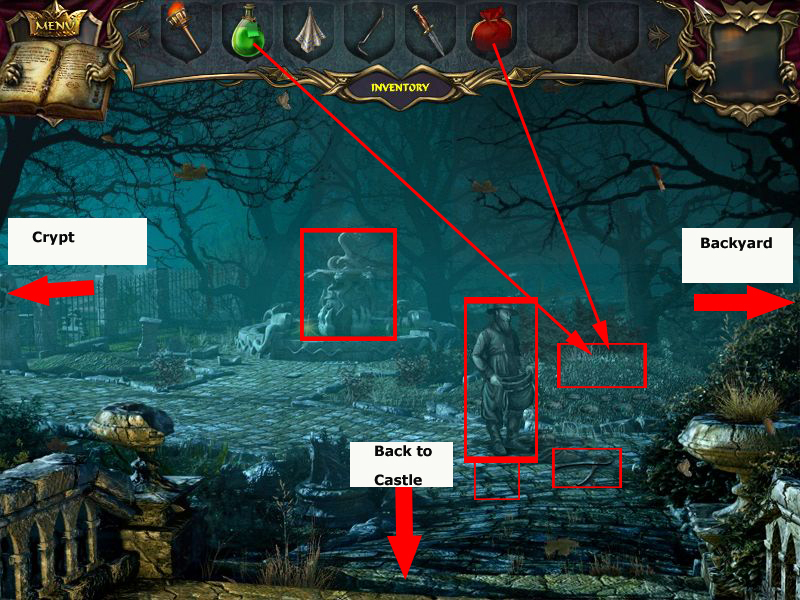 The mirror top right is your hint button, it will help you in ho-scene as well as in other scenes where it shows you what to do or where to go. 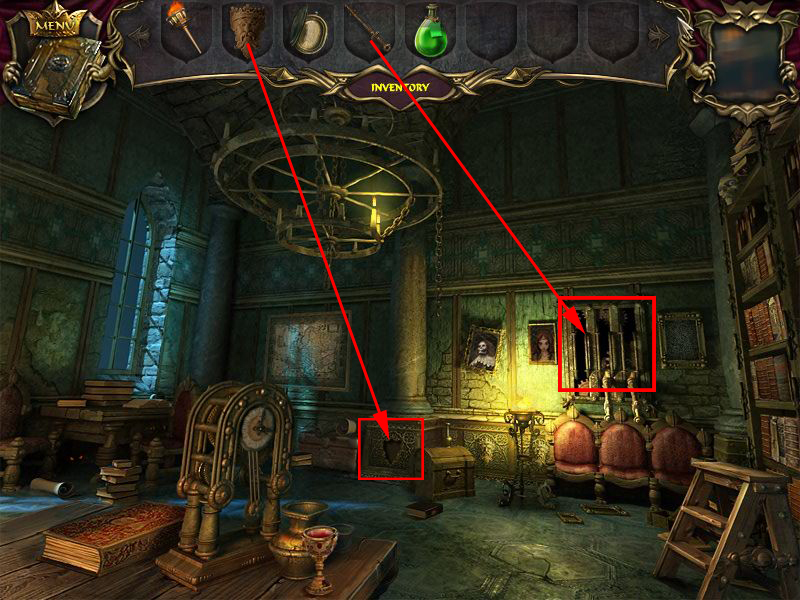 In each ho-scene you can find two mirrors for additional hints. If you enter a Ho-Scene a second time the mirrors will not be there if you have already found them. Some objects from your list are hidden as words. 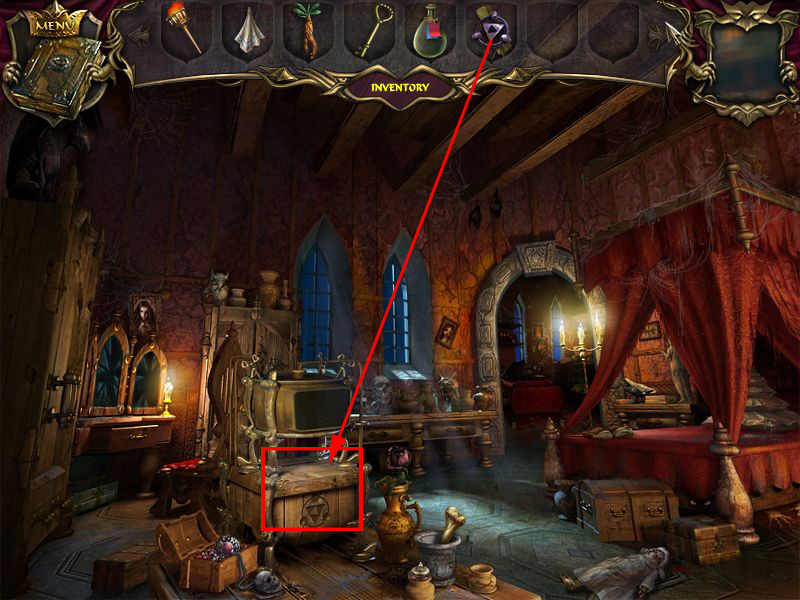 Objects on your list written in red, indicate interaction such as a mini game or opening a drawer for example. Mini-games can be skipped after short waiting time. Follow the Tutorial and pick up the book. Go left into the studio. 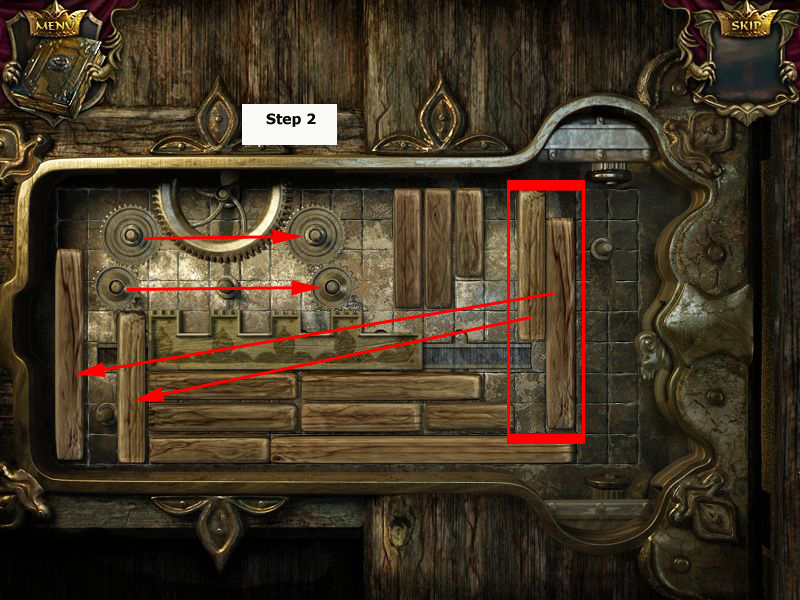 The mirror shown from the tutorial is your base of 10 hints. Find the objects from your list. 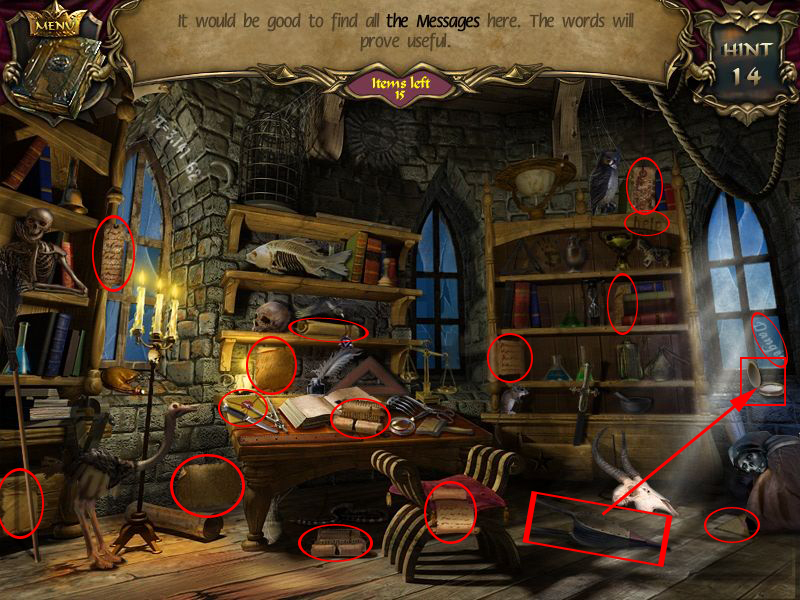 The letter will be found by clicking the book low left corner, since you find the red written letter. At least you will be asked to return to throne room with a burning torch. Grab one of the burning candles far left and light the torch left side with it. Click the torch to get it into your inventory. Go back into the throne room. Get the torch out of your inventory and light the candles left and right to the throne. 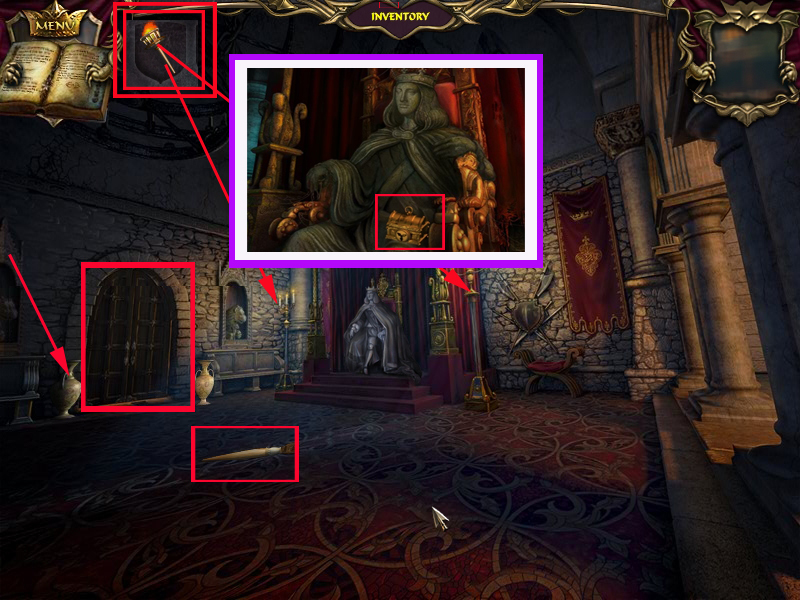 Click the prince on the throne, he is holding a locked casket, you will need to find the key. Click the vase left from the door on the ground, it will break a brush will fall on the ground. Use the brush to pick the lock, a key will fall to the ground on the other side but luckily you can pick it up from here. There is nothing to do here right now, so into the back part of the hallway. The doors to the left and right are locked, the Nanny is petrified. Pick up the paper scraps right next to the Nanny on the ground. Click the frame's right side and in the nearby view the scraps into the frame. You will have to reassemble the picture. When you click a scrap into the frame it will be shown completely. A part at the right place will be locked, at the wrong place it will fall down again. 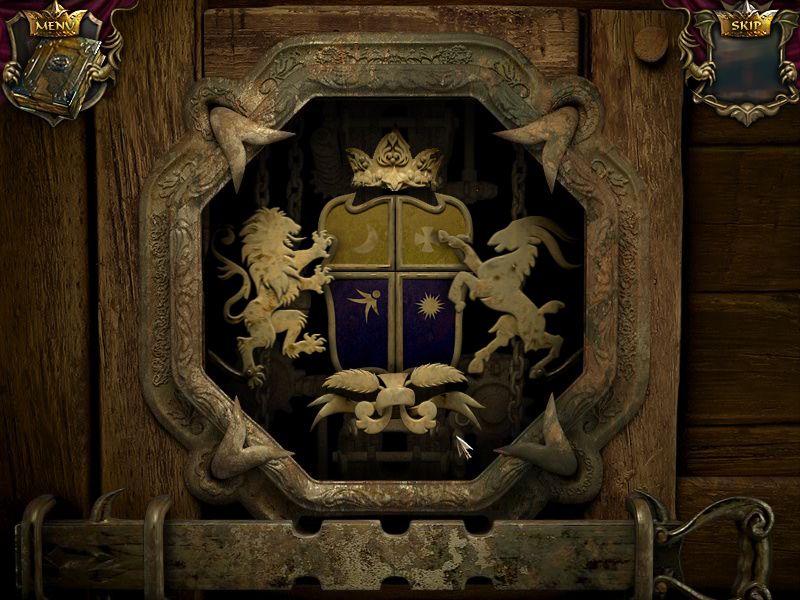 When you are done click the crest of the prince's shield, it will be copied into your journal. Click the sparkling area far left to enter the ho-scene. Find all the listed object. 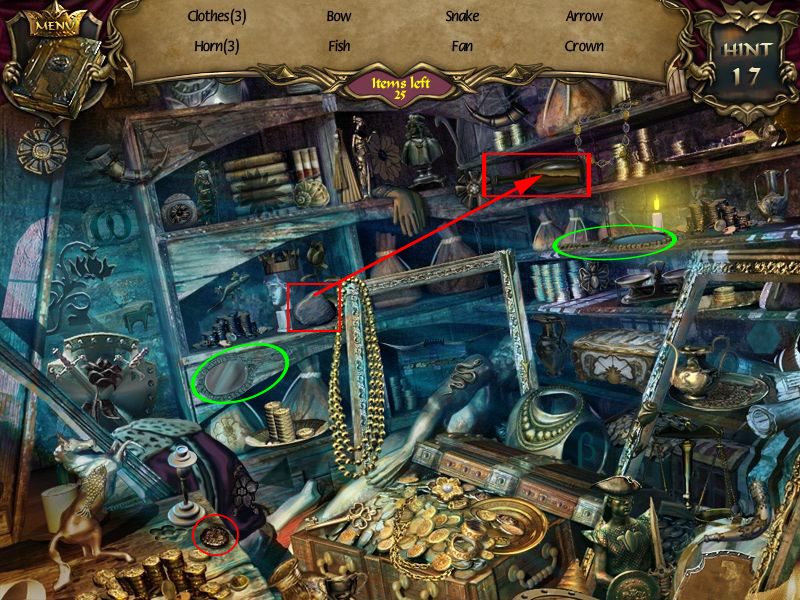 To get "heart with arrow" pick up the arrow from the top shelf, far middle below the heart. 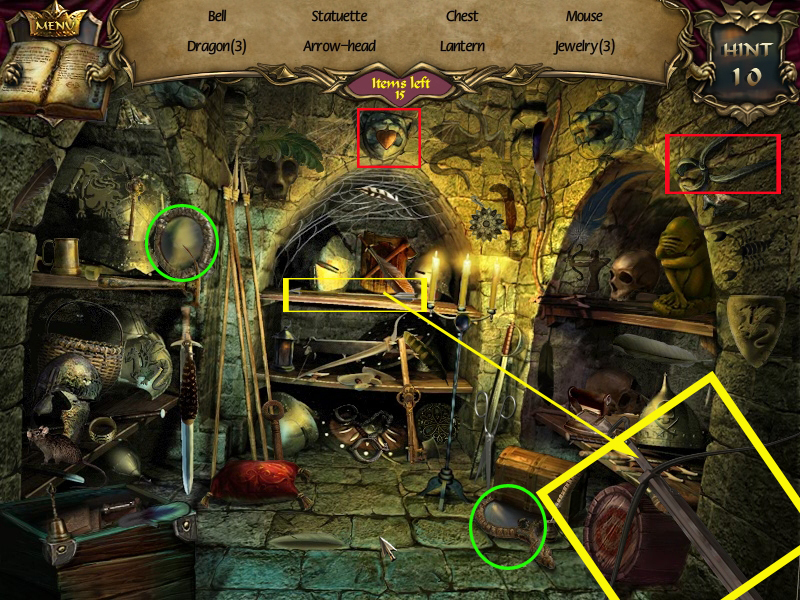 Click the arrow onto the bow bottom right corner. Now you can get the "heart with arrrow". At the end you will asked to find the tongs, they are in the upper right corner. Also collect the two mirrors. Far left behind the door you can find a shield. At the wall far middle click the shield, it will fall down and you can see a metal plate saying: "Metal will cut the wood". 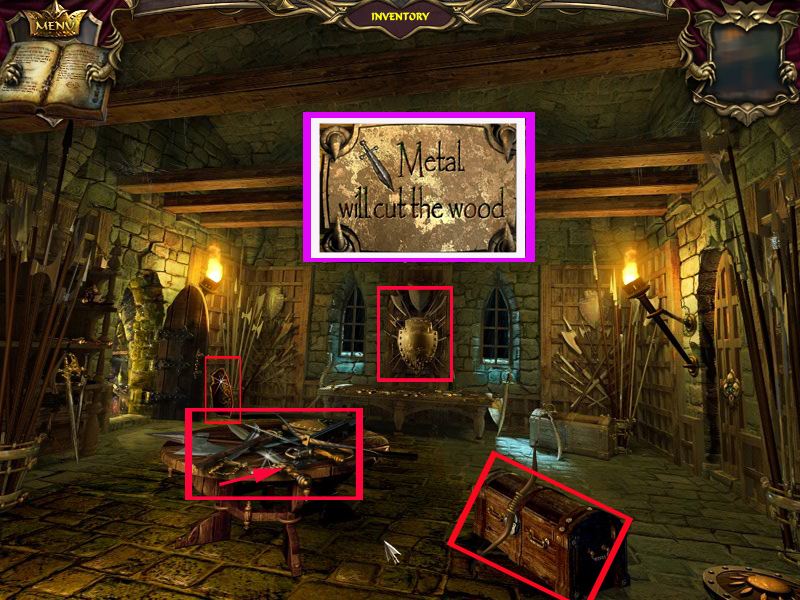 Click the table in the middle and one of the weapons will fall on the ground. Do this until there is only a sword left. Pick it up, it will go into your inventory. Put the shield and sword from your inventory onto the knight to your left. Grab the scroll that will appear in the knight's hand. 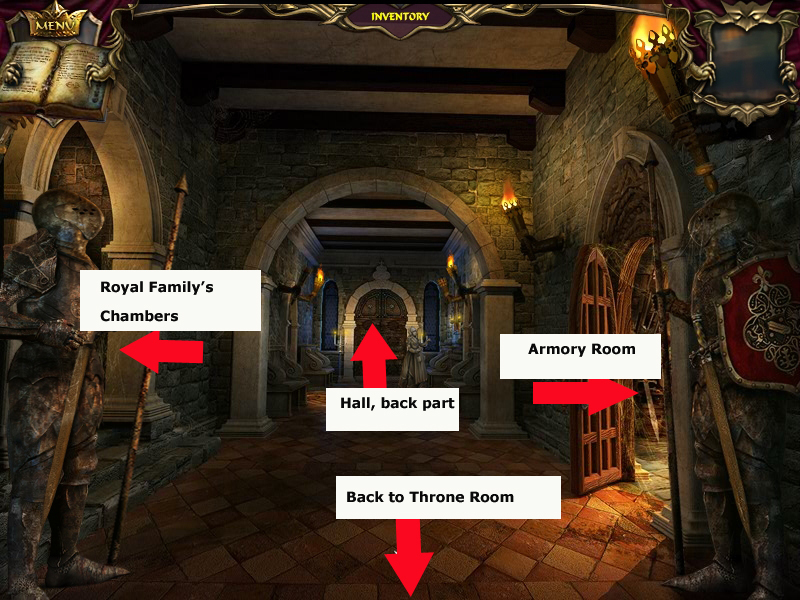 The knight has moved and you can enter the hallway of the royal family chambers. The rooms left and right are locked. Pick up the crystal key left side on the ground and click the door in the back. You will have to reassemble the crest according to the example in your journal. To do so; click the four parts of the crest and the symbols right, left, above and below, until you have the right combination. Enter the court tailers room. Click the sparkling area to activate the ho-scene and find all objects from your list. For the jug's shadow place the jug from the shelf onto the silver plate on the table. At the right of it you now can get the shadow. Lastly you will be asked to get a beaker you will find far middle in the scene. Now click the petrified tailor and learn that a feather is missing. Click the tree on the table right side to get a nearby view. Clicking the branches will shake some seeds down, but you will have to come back as you do not have anything to grab it with. Click the sparkling area to activate the ho-scene and find the 14 royal symbols. Some objects are to be found as written words. Click the checkered board on the ground low left, two tiles will place one on top of each other, this is a royal symbol as well, click it to get it into your inventory. Now you will play memory. Click on 2 doors to see what is underneath. If the pieces match the doors will disappear. 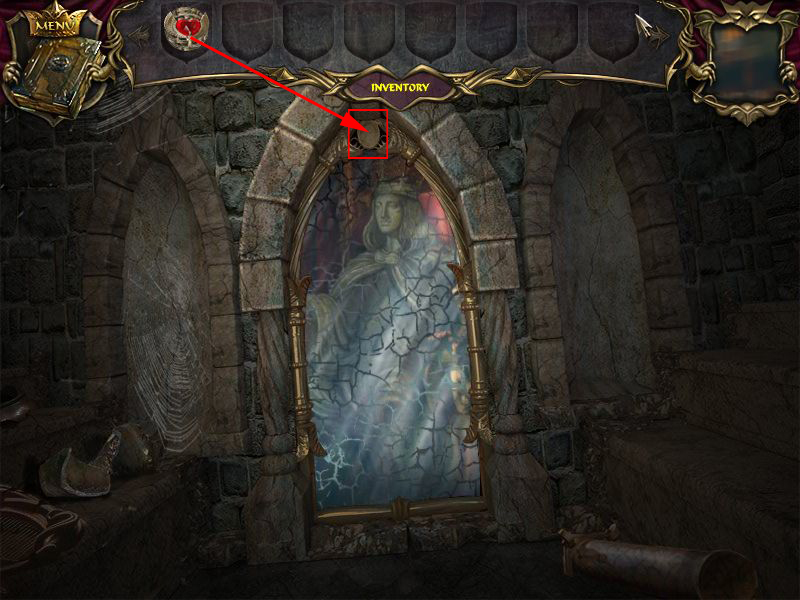 When there is only one door left, click it and a bas-relief with King's Image will go into your inventory. 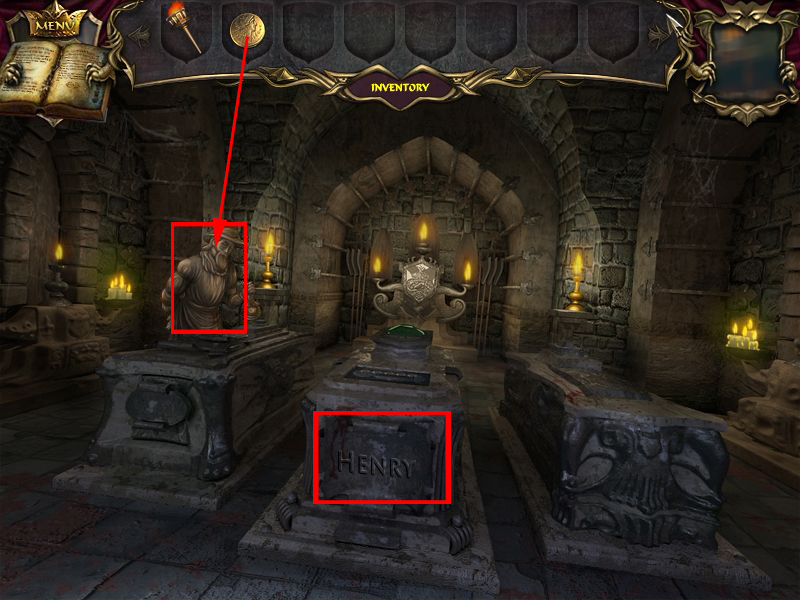 Click the petrified prince and use the crystal key from your inventory to open the casket. Go back to the hallway of the royal family's chambers. Click the left door for the princess room. Use the tongs from your inventory to loosen the screws upper right and left. 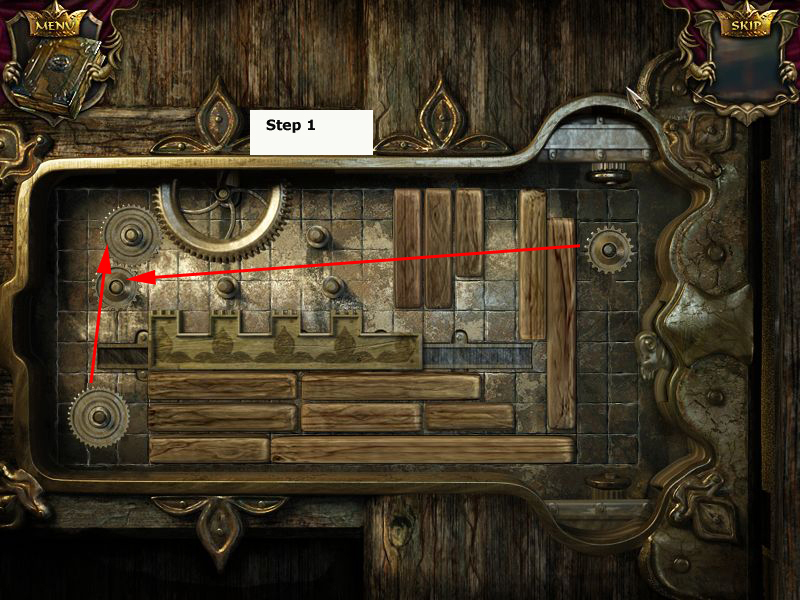 Your goal is to unlock the key block by moving the wooden bars and gears in order to open the latch. 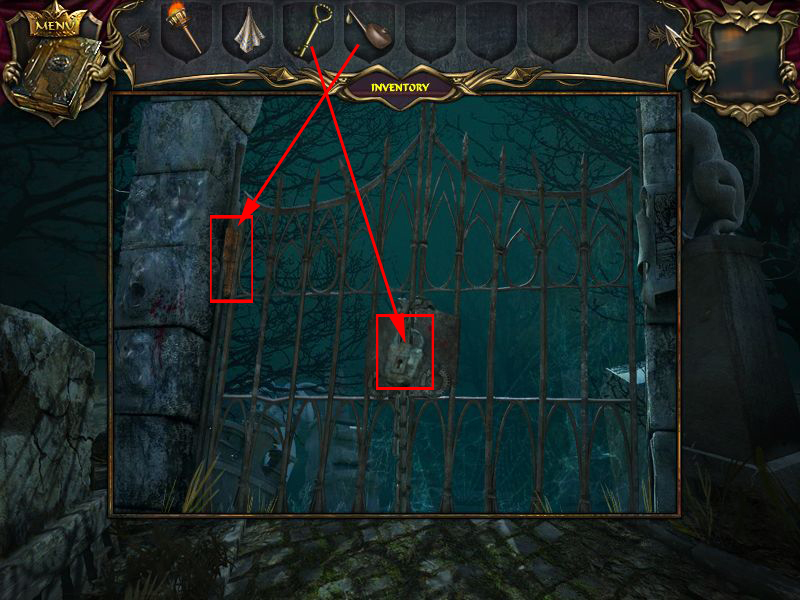 You can see a white outline behind the bars when they are in a spot you can place them in. First place the two gears left below the big moving one. The latch moves a little to the right. Now place the longer bar of the two right side completely to the left. Leave a space of a bar size and place then the other bar. Place the bigger of the two gears right side below the moving one. Below this one place the smaller on. The latch moves to the right and opens the lock. Click the sparkling area to activate the ho-scene and find the lists from your objects. Don't forget to look for the mirrors. For the hand print, get the hand right side and click it onto the coal on the table. Now get it back and click it on the scroll at the back of the chair. The lever you will find right side under the desk. Click on the drawer on the left to open it. Click on the green chest in the lower left to open it. Pick up the paint inside the green chest. Place the green scroll on the device in the lower middle. Click on the device again to get a nearby view. 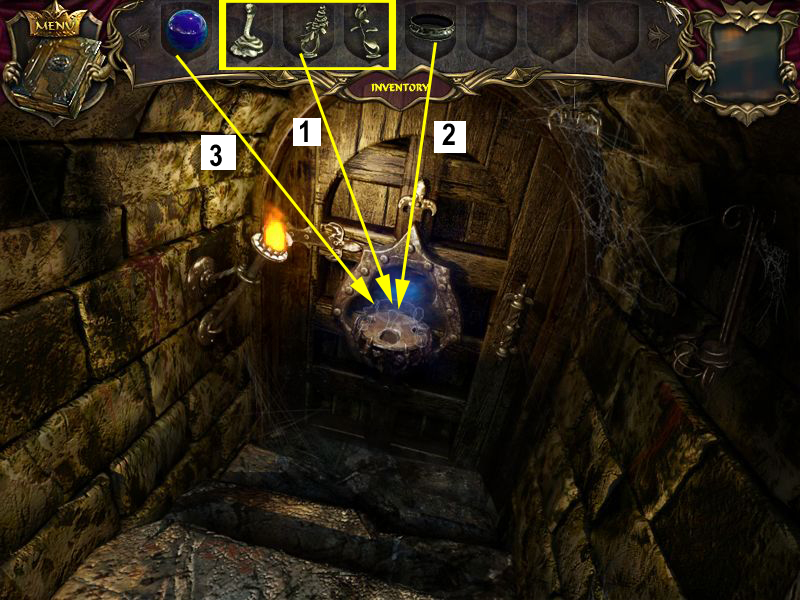 Place the beaker from your inventory on the screen to trigger a puzzle. 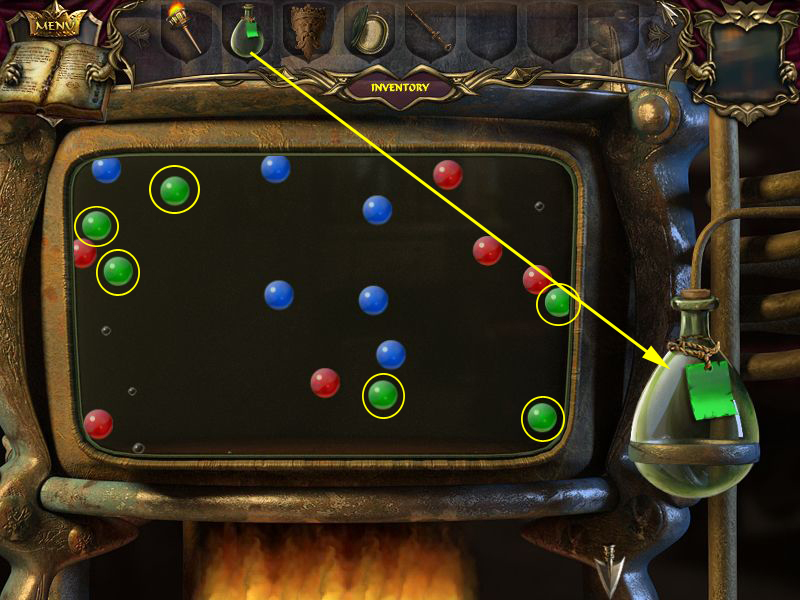 Your goal is to collect only the green balls into the beaker. Hover your mouse over ball and a sphere or spheres will appear over all the elements which are touching. You only want to click the balls when the green ones are the only ones highlighted. As this the beaker will be filled with green liquid. Clicking the wrong spheres will make your liquid evaporate and you will have to start over. Click the beaker once it has been filled up. 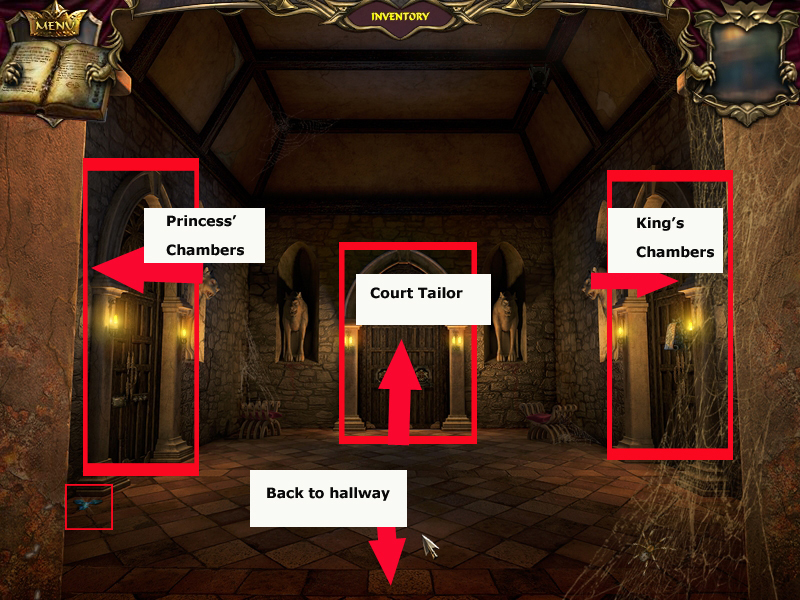 Now click the right door to the king's room. Get the paint out of your inventory and place it upper left. Your cursor will change to a brush automatically. Click on the color you want to use and it will be added to your paintbrush. Click the color onto the spot you want it to go into. If you want to clear a color you can simply paint over it or click the water jar in the lower right corner. There are several solutions possible, the screenshot shows one example. 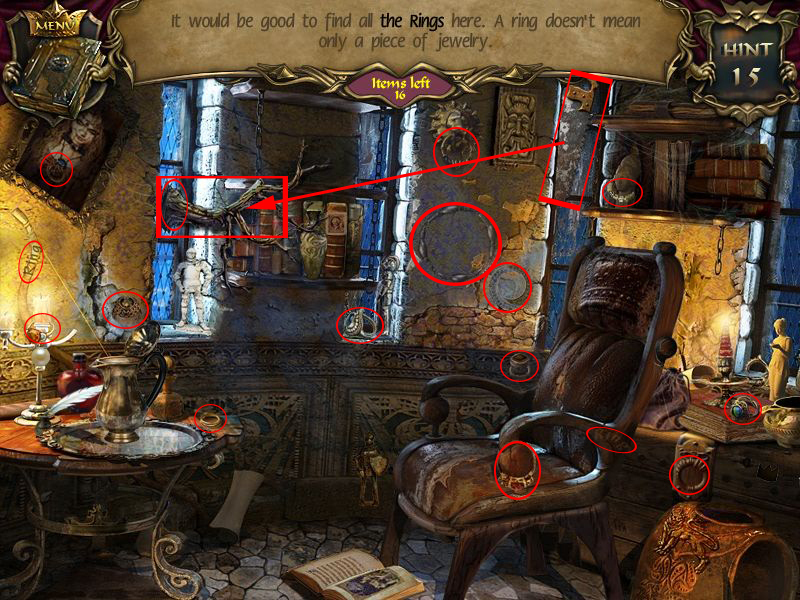 Click the far center of the scene, open your inventory and place the king's relief into the empty spot. 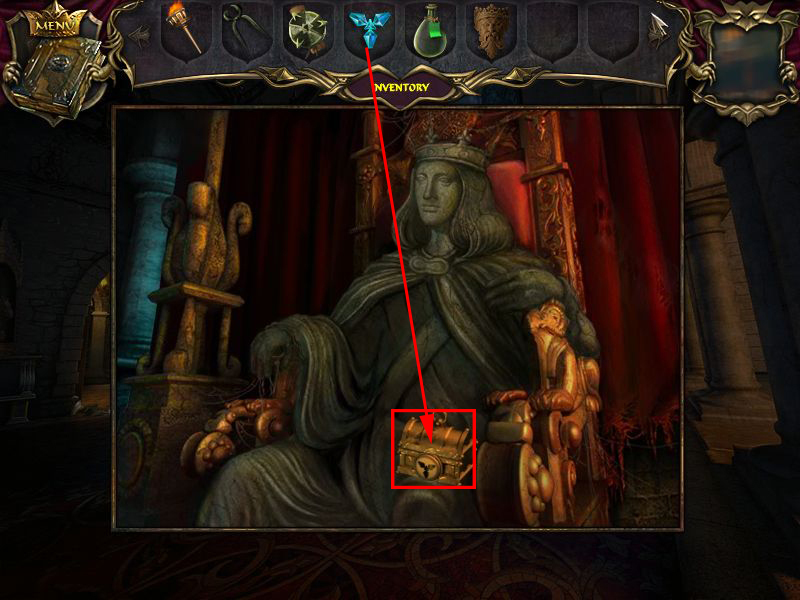 The compartment opens, pick up the prince's picture, it will combine with the medallion. Now use the lever at the device right next to it. You can see that somewhere a door opens. Leave the room and go back to the petrified nanny. Get the medallion out of your inventory and give it to the nanny. This will free the nanny and she will leave a handkerchief on the bench for you, which could be of further use. Get it into your inventory. Go left to enter the tower. Click the stone standing out of the wall right side 2 to 3 times. It falls down and from the compartment you can grab a golden key. There is nothing more you can do here right now, so go up the stairs. 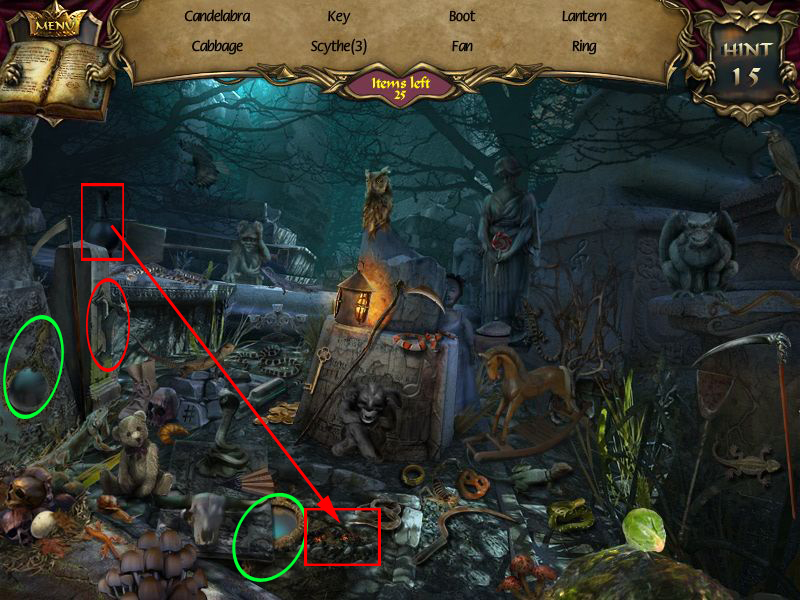 Click the sparkling area to trigger the ho-scene and find the listed objects. 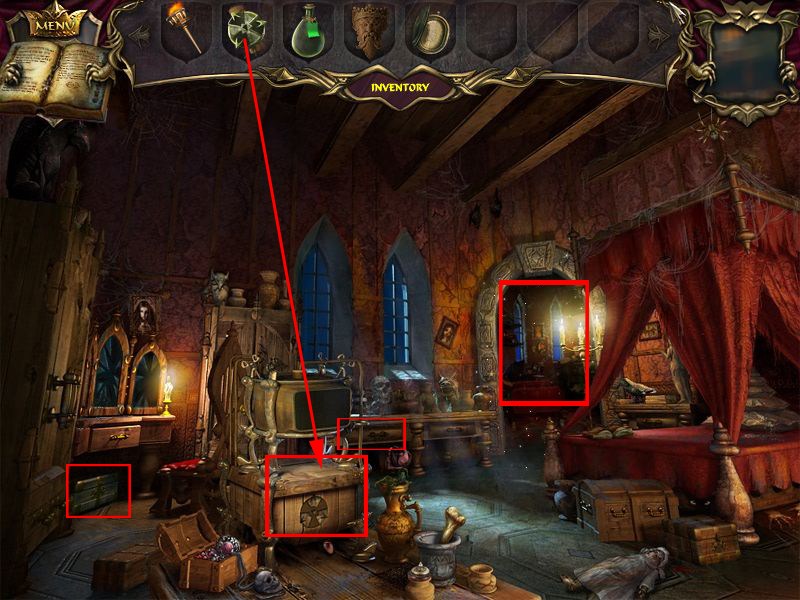 To get the 5 grab the broom left corner and remove the spider webs at the left window. Click the now to see 5 to get it into your inventory. The gear you will find at the wall below the left window. Now grab the red bag from the top shelf left side. Click the right window, but it is closed and you have no key and nothing to pry the wooden floor boards either so go down stairs again. 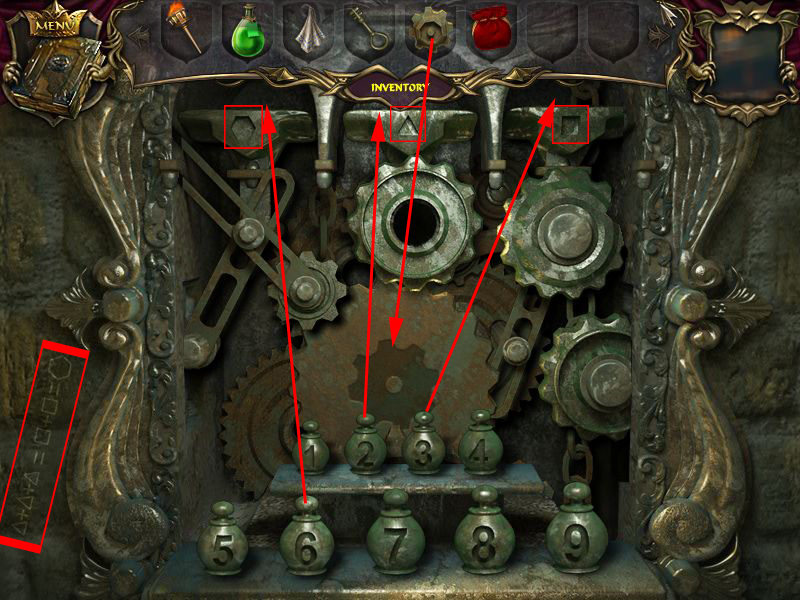 Click the horned face at the right side, open your inventory and place it in the middle of the mechanism. Now you have to find out, which weigth goes where. Low left you will find a hint, showing a geometrical shape. Place gears on the pedestals in the upper center to bring the gears to the correct positions so they can move. 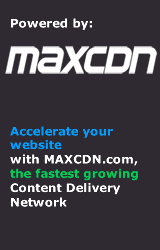 Click on a weight to pick it up and attach it to your cursor. To remove a weight simply click on it and place it in another spot, or at the bottom of the scene. You can only place one weight in each spot. 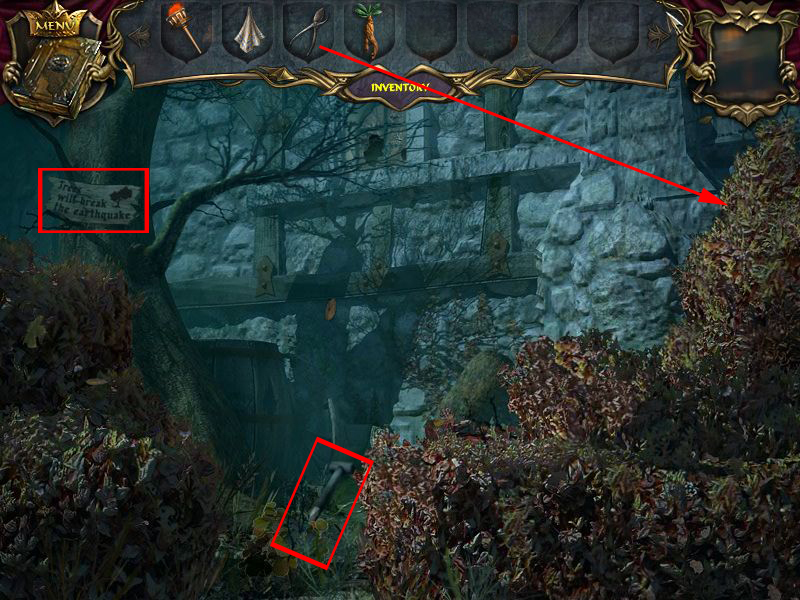 You will see an image of the door to the square opening. But first go downstairs into the armory room. Click the sparkling area to enter the ho-scene and find all feathers. For one feather get the scissors at the bottom of the right arch column and cut open the red pillow at the bottom of the left column. Click the feather you see then. 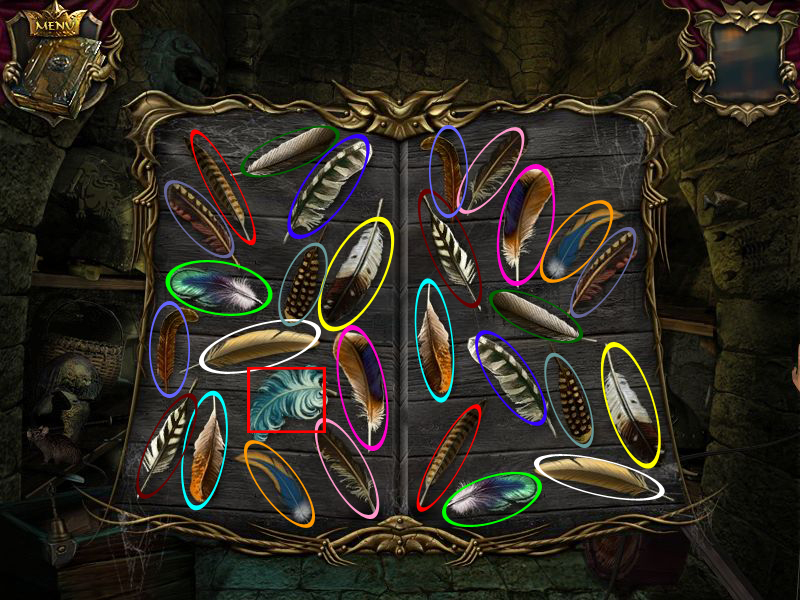 In the following mini-game you will need to click the matching feathers right and left side, until only one is left. Click this one to get it in your inventory. Use the key from your inventory to open the trunk on the ground, low right side. Get the crowbar out und go back to the tower. Get the crowbar out of your inventory and pry open the wooden floor boards below the right window. Get the knife out of the compartment. Use the crowbar again to pry open the windows lock. The window shutter opens and a metal ring falls on the window sill. Pick it up, looking down you see a place with a well. Leave the tower and go back to the court tailor. Click the sparkling area to access the hidden object scene. 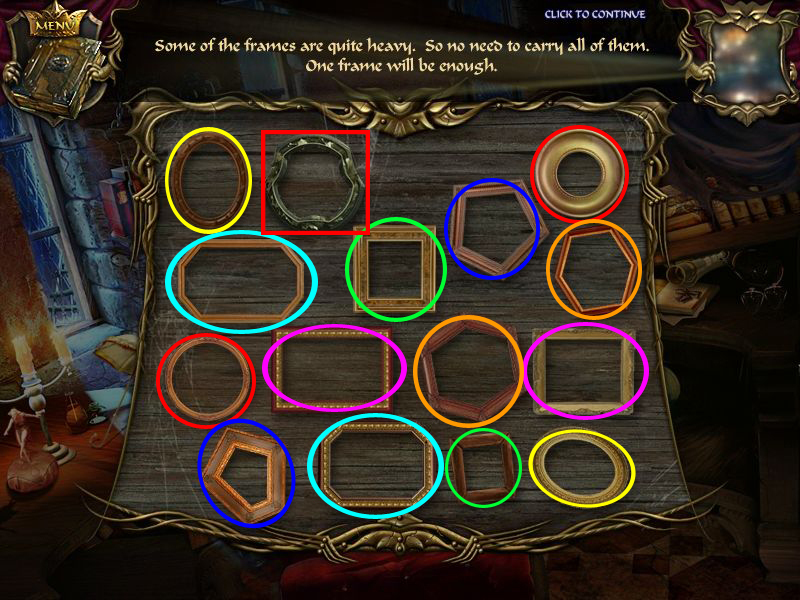 Find 16 rings (not only jewelery). 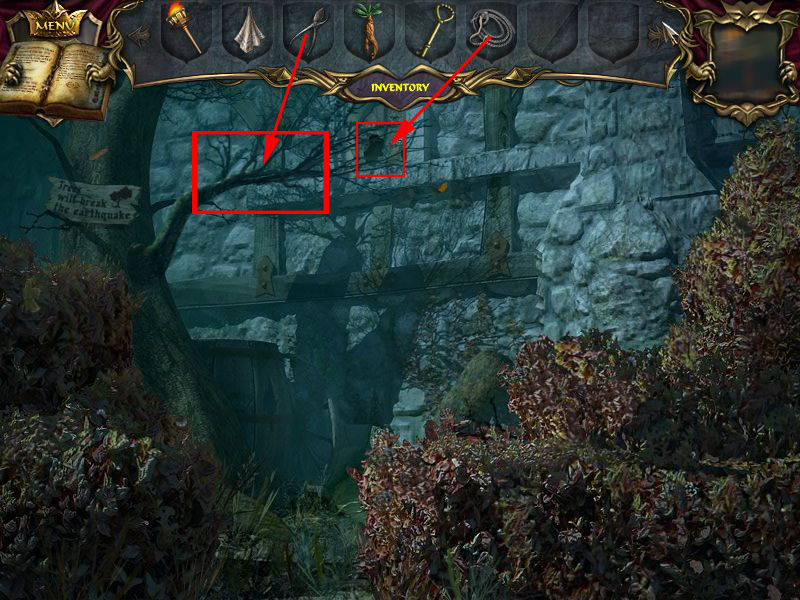 One you will get by using the saw hanging far middle at the wall and using it with the branch at the left window. Click the ring the cut branch shows now. You will need to match equal rings or ring or words in the same color. A door knocker will be last, click it to get it into your inventory. Click the little tree under the window. Get the red bag out of your inventory and click it onto the seeds. (If you did not do it before, click the trees branches to let the seeds falls down). Get the bag back into your inventory. 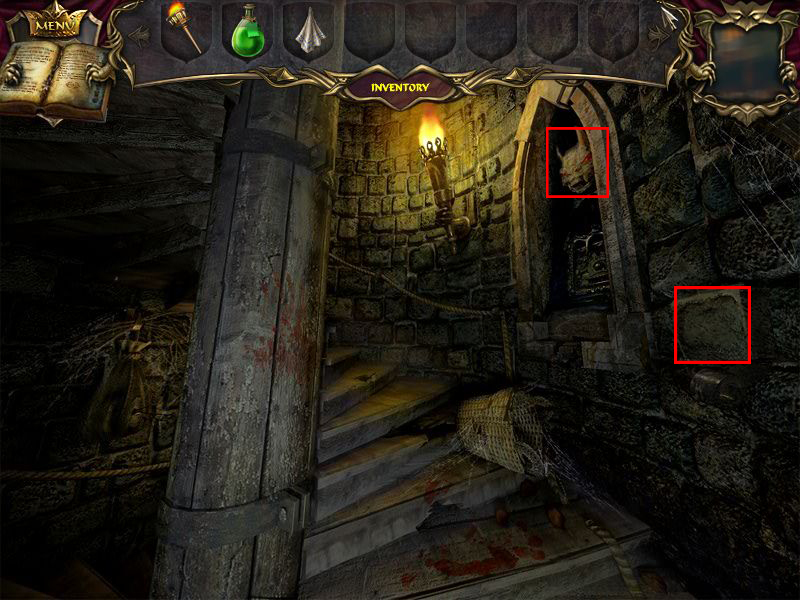 Go back to the back part of the hallway, where the petrified Nanny was standing and click the door in the back. 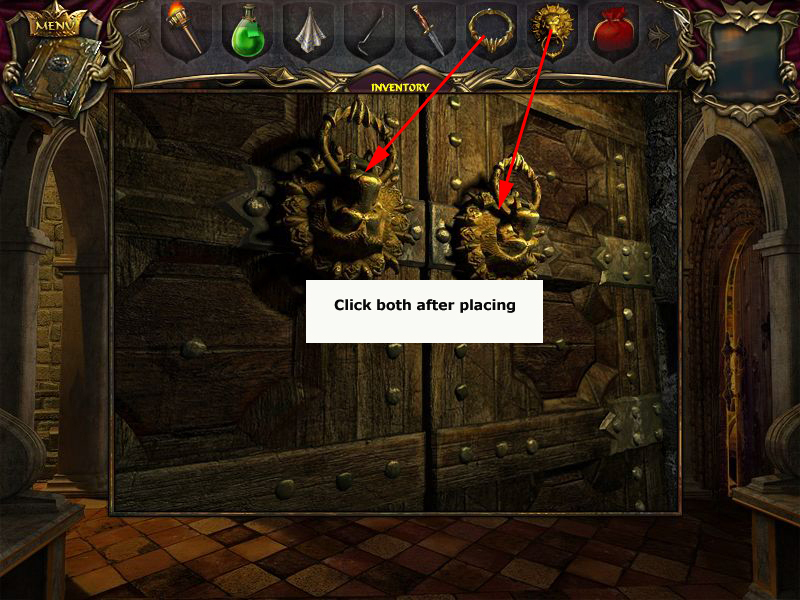 Click the door and open your inventory, place the ring left and the lion door knocker right side at the latch. Click both door knockers to open the door. You see the enchanted gardener. Get the garden shears, laying at his feet. Open your inventory and get the seeds out. Click them onto the green next to the gardener. Pour the green liquid over it, the plants growing and the gardener is released. He tells you, that the tailor maybe knows more. At the place where he stands a good smelling herb will be left, click it. Right side leaves are laying, click to make them disappear. Click the plate underneath and read : Water defeats the fire. Use the crowbar from your inventory to pry open the grate in front of the well and click the hole. You will have to assemble the pipes and turn on all the taps. 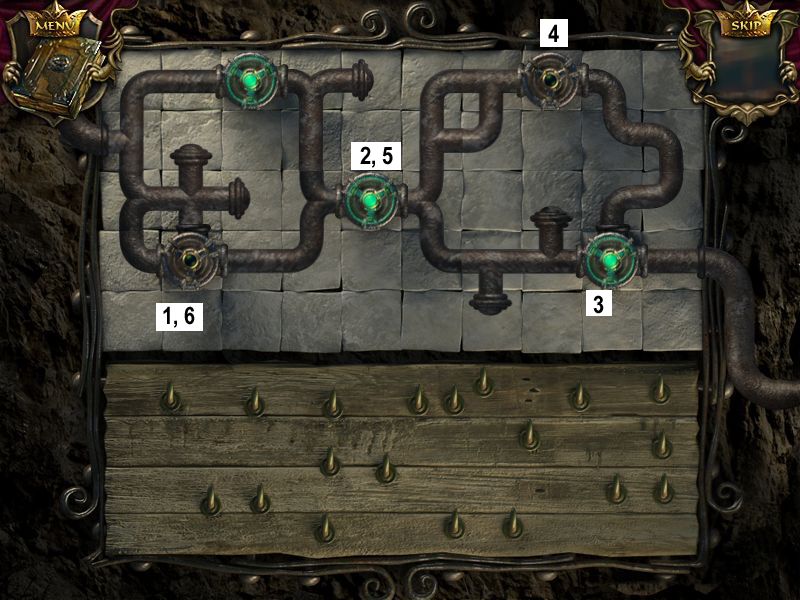 Drag the pipe pieces at the bottom of the puzzle and place them on the taps. Pipes in the right spots will darken and lock. Once the pipes are in place, you have to click on the valves in the right order until they are lit in green. Clicking one valve will cause reactions of other valves. Click first the low left valve, then the middle one, followed by low right, top right, middle, low left. Go to the right and enter the backyard. Get the garden shears out of your inventory and use them to cut the bushes. Click the spade a few times to get it into your inventory. Go back to the square and choose left the way to the crypt. 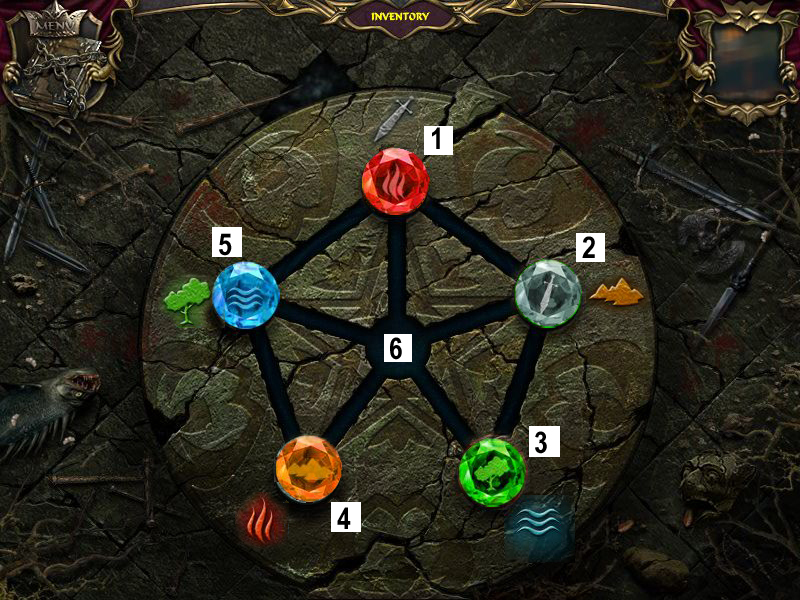 Open your inventory and use the knife to cut the rope at the right statue. It will fall down, click to get it into your inventory. Now get the spade and use it at the soil low left. 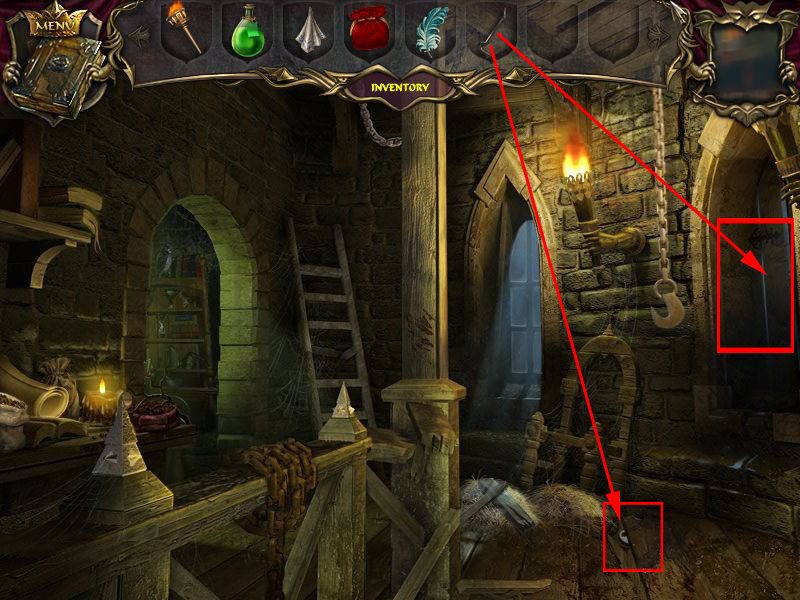 Get the hook out of the hole, it will combine automatically with the rope inside the inventory. At the bottom of the second statue you will find another plate: Earth will stop the water. Click the plate and it will lower. Get the key behind it. Go back to the backyard. Get the garden shears from your inventory and cut the branch right of the right. Use the rope/hook and click the window with it. To climb up, click the window again. As it you enter the kitchen. Get the empty beaker from the shelf right side. Click the barrel in front of the door very fast ever and ever again until it lays left side and fluid is running out. Click the hole to learn that it is oil. Click the door and your are in the back hallway. Click the sparking area to access the ho-scene. Find 15 of all kind of notes. For one use the bellows from the ground with the powder box on the right windowsill. The powder will bring the word "Danger" onto the window, click it. 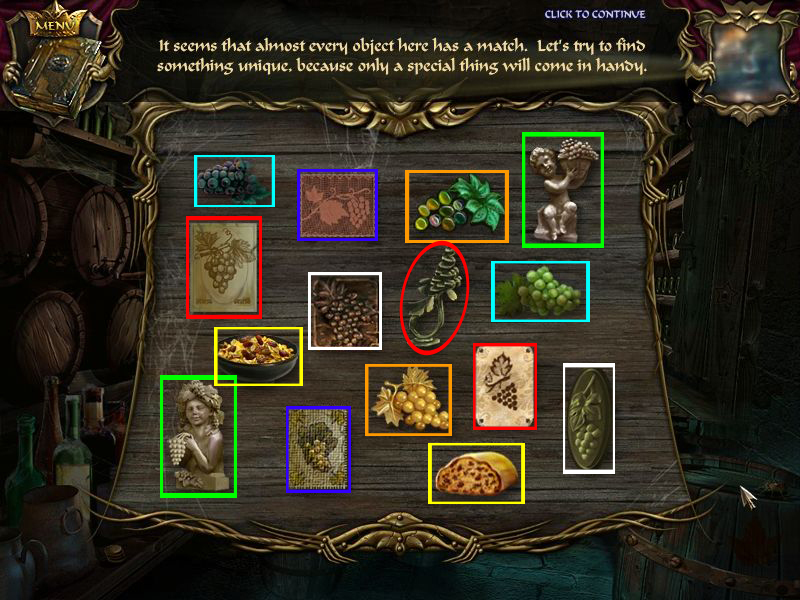 Match identical notes and click the last object left, a violet scroll. Leave the scene and the tower and go back to the princess' room. 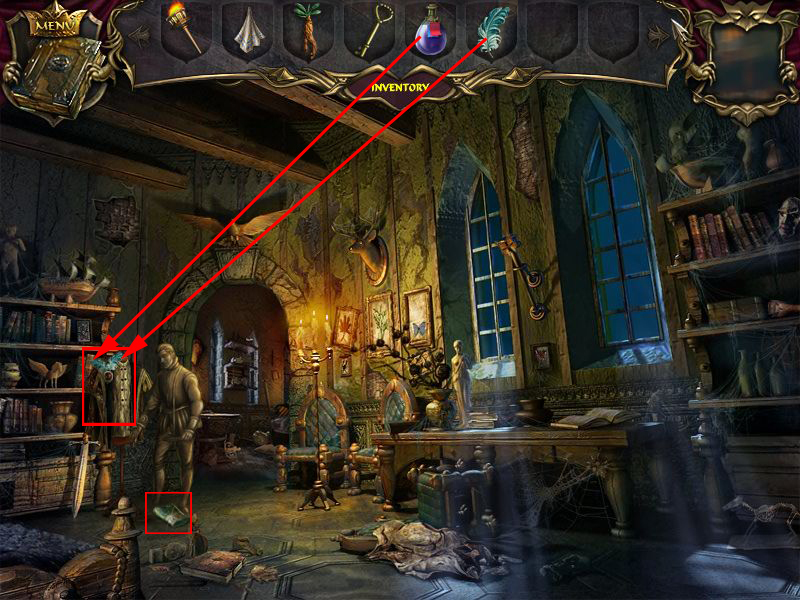 Place the Violet Scroll at the bottom of the device in the lower center of the scene. Click on the device again for a closer view. Place the Empty Beaker anywhere on the scene. 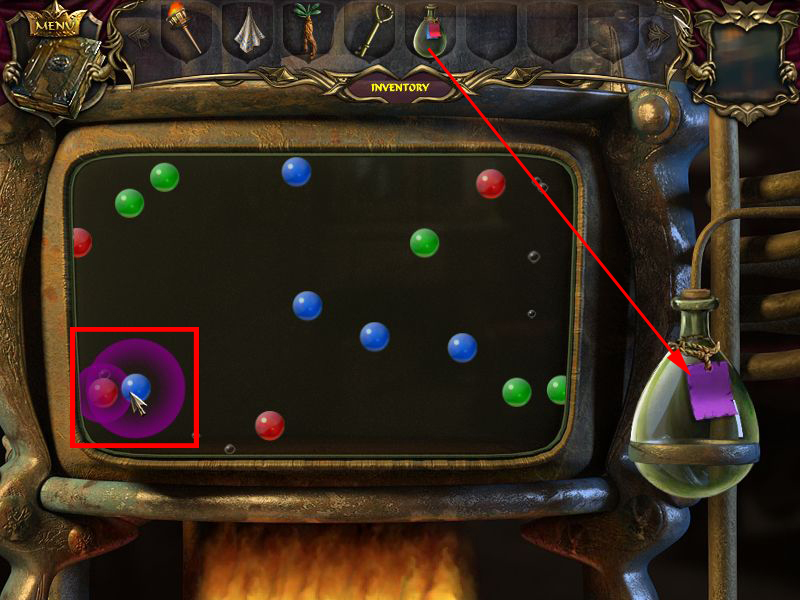 It is the same mini-game as befor, but this time you collect only the red and blue (=violet) balls into the beaker. Click the bottle into your inventory, when it is full and leave the room. Go and see the court tailor. Get the feather out of your inventory and click it onto the unfinished suit. Now pour the violet liquid over it. 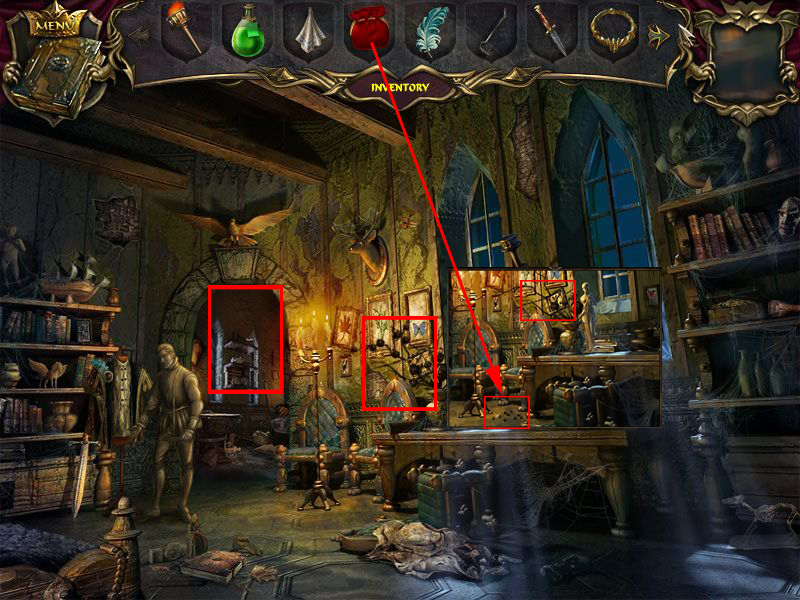 The tailor tells you that he saw someone behind the mirror in the prince's room. He will leave a oven mitt for you to pick up. Open your inventory and get out the oven mitt. Use it to take away the pot lid at the fire place. Throw the good smelling herb from your inventory into the pot. The cook awakes and tells you, that the king seems to have a dark secret, which has to do with the tower, but the tower is always locked. Click the sparkling area to access a ho-scene. 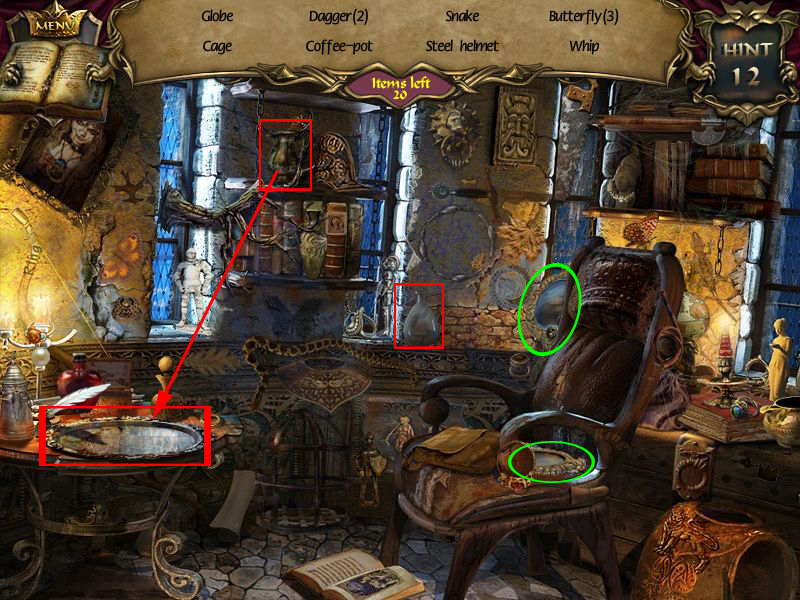 Find the objects from your list and the two mirrors. For the glass of wine get the glass from the shelf left side and click the wine barrel faucet. The oil can you will find on the right front barrel. Exit the ho-scene and get the oil can out of your inventory. Place it at the leaking oil barrel and get the filled oil can back into your inventory. Leave the kitchen, go to the square and choose the way to the crypt. 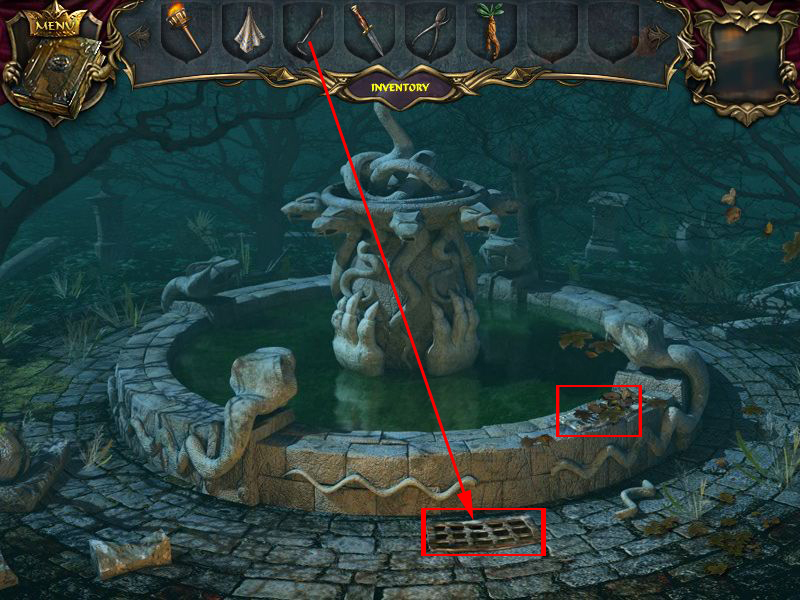 Click the gate right side between the two statues. Open your inventory, get the oil can out and used it with the hinge left side. Use the key from your inventory with the lock. The door opens, click the sparkling area for the ho-scene. Find all objects from your list and do not forget the mirrors. For the smoke get the jug far left and pour its content about the fire place. 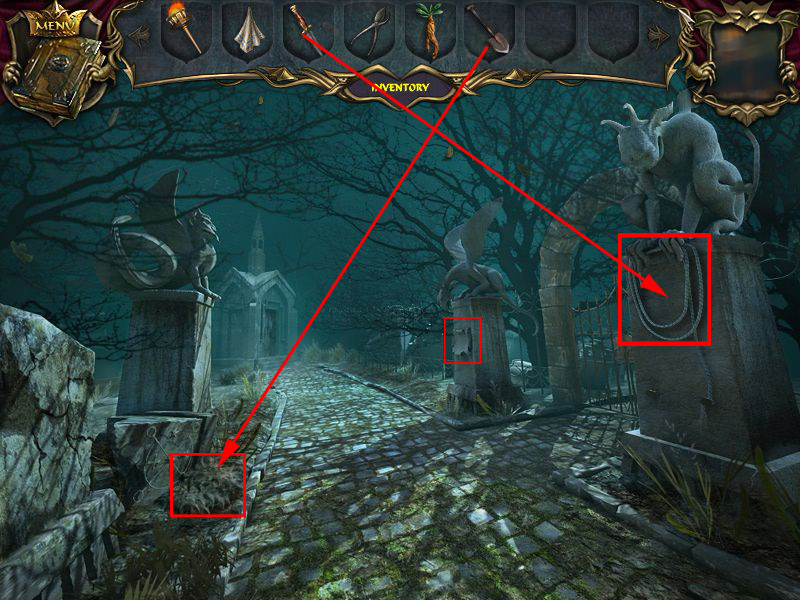 The door opener you will find left side at the grave stone. Go back to the well and from there to the tower. Click the right window to see the well. Now that the water is gone, your can easily see the symbols, which will be copied into your journal. 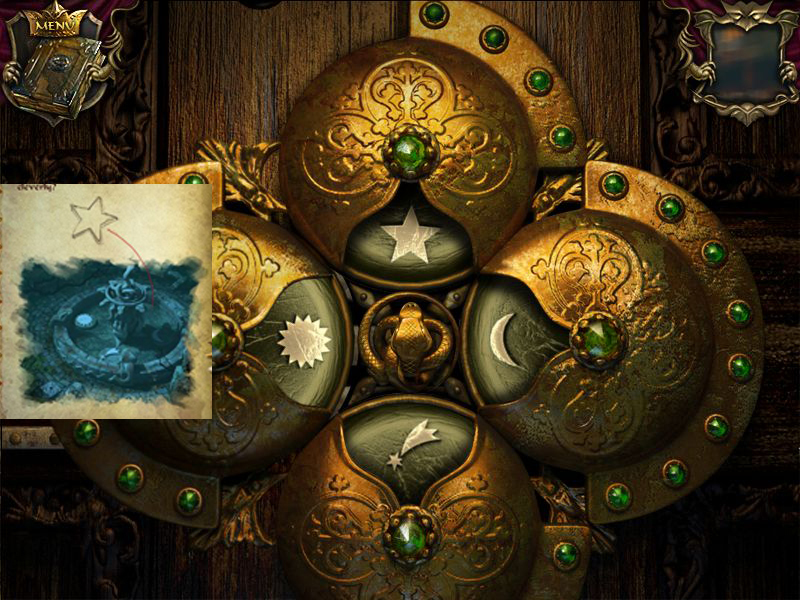 In your journal you finally have all four symbols for the locked door in the armory room. Leave the tower and go to the armory room. Click the door to your right to get a nearby view of the look. Click the symbols until you have the right ones. Doing it right will give you a sparkling area you have to click to access the ho-scene. 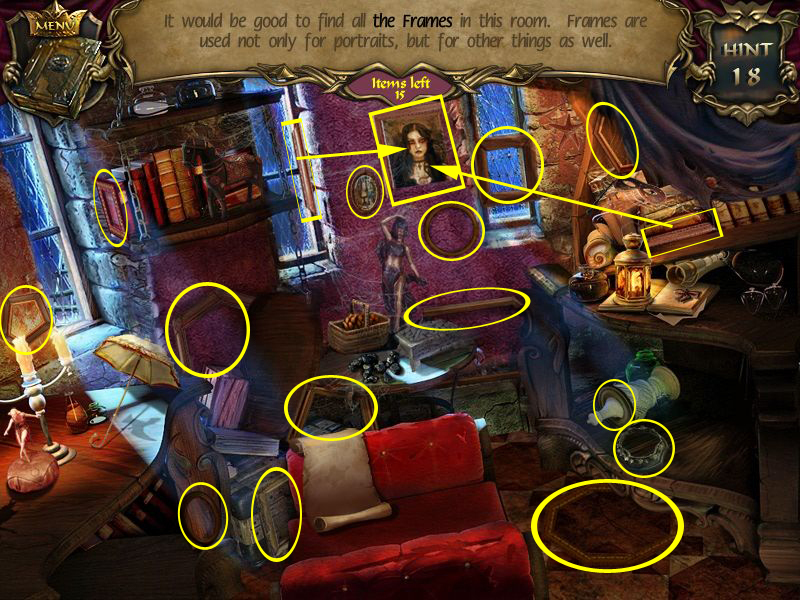 Find the listed objects and the two mirrors. For the letter you need to smash the stone from the shelf and smash the bottle mail on the right shelf. The dirty coin lays on the table left. It will be automatically cleaned by the handkerchief inside the inventory. Leave the scene and the armory room and go to the crypt. 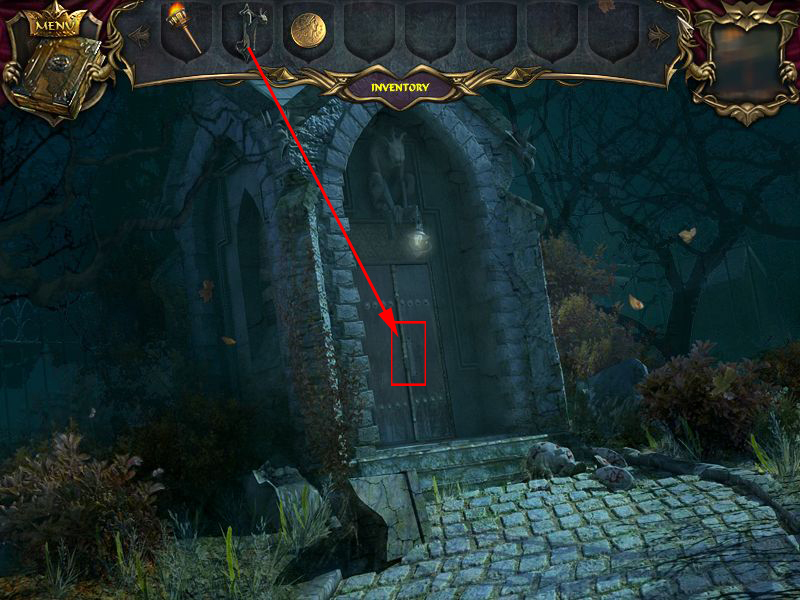 In front of the crypt open your inventory, get the door opener and click it on the crypt's door. Click the door once again and enter. 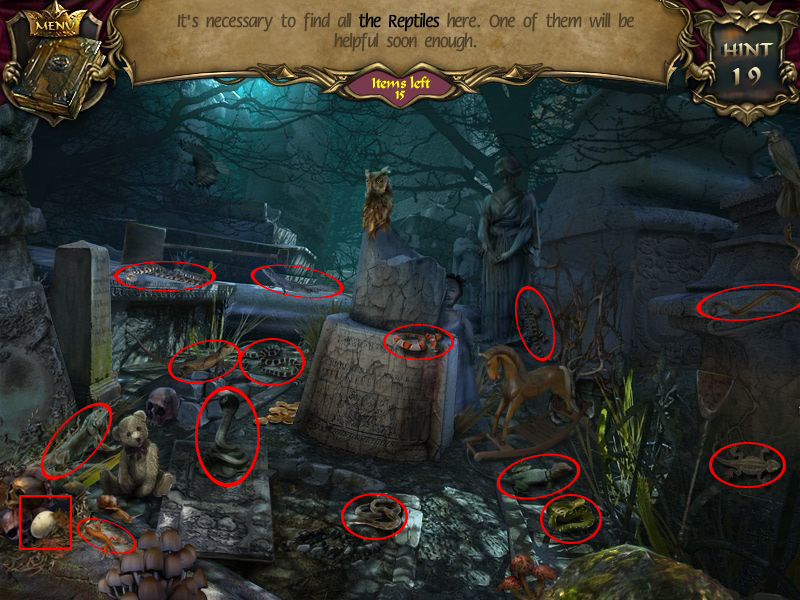 Give the gold coin to the petrified coffin maker, next to the left coffin. He tells you about as he followed the princess, wondering what she wants here. He leaves a magic blue sphere for you to take. 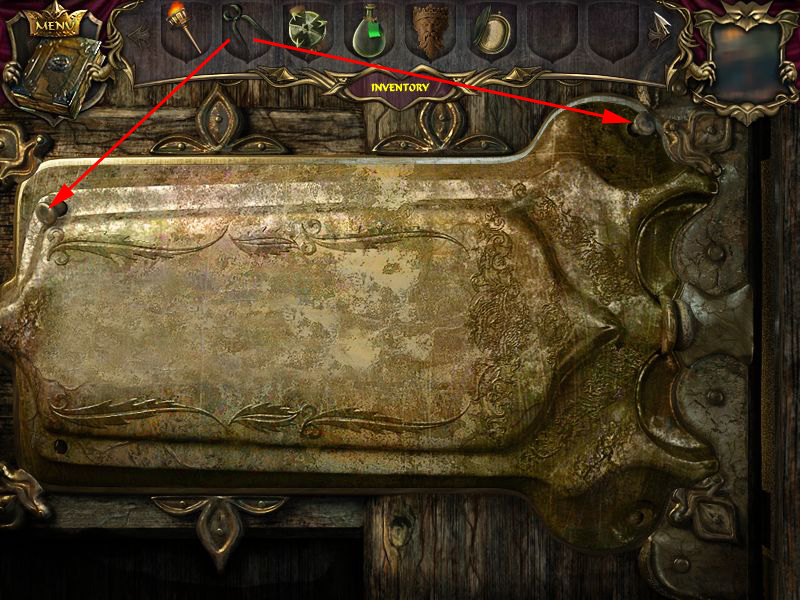 Click the middle coffin to trigger a mini-game. You will need to decipher the king's name by rearranging the letters. You can only click on the letters at the right and left ends of the puzzle. When you click on a letter on the left end, it will travel through the top bar and land on the next to last slot. When you click on a letter on the right end, it will travel through the bottom slot and land in the 2nd slot. The coffin opens, go inside. Open your inventory and get the torch out, place it left next to the door. 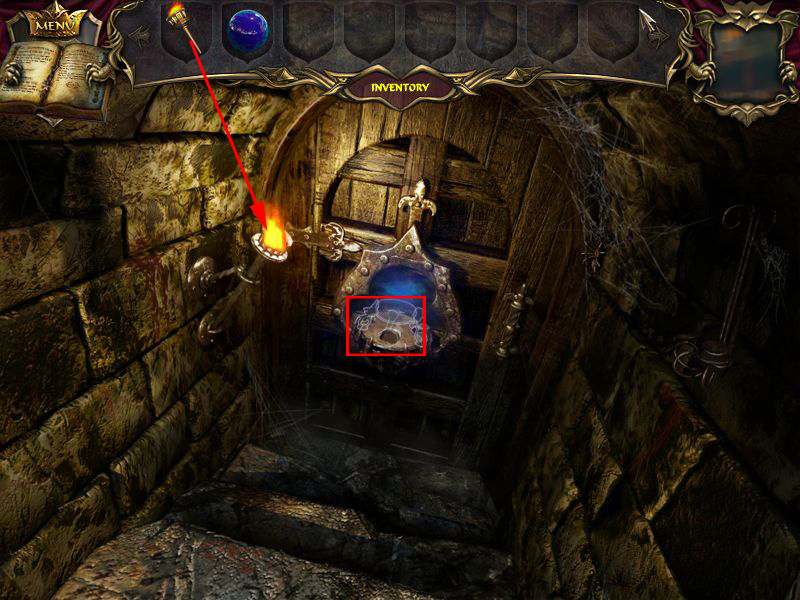 The door in front is locked and only the blue magic sphere can open it but the parts of the stand are scattered all around the castle. A note is in your book that strangely enough, everyone has been talking not very nicely about the princess. Go back and stop at the iron door. 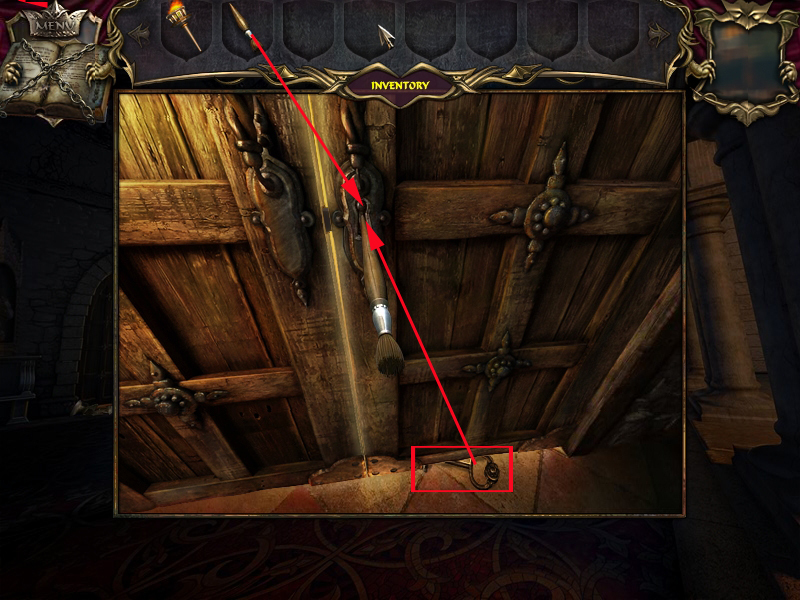 Click the sparkling iron door to activate a mini-game. The last one is the egg in the low right corner. 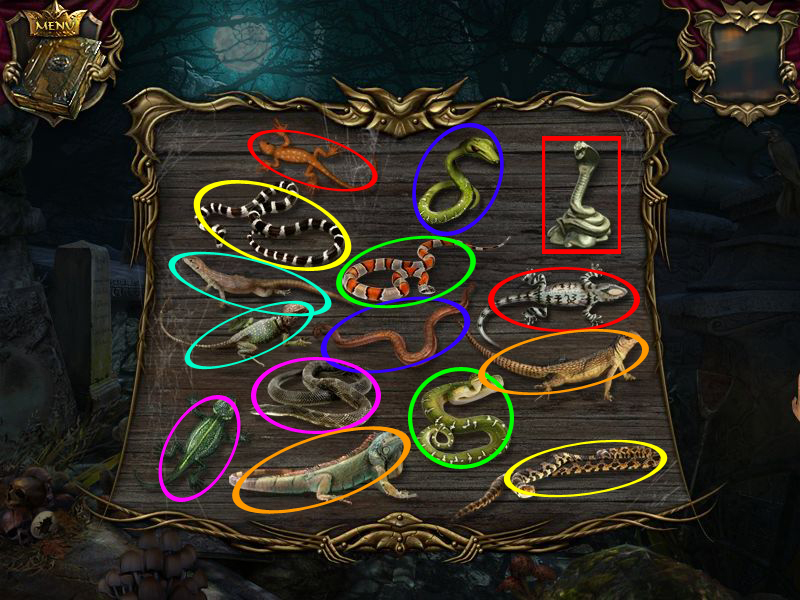 Click the egg several time to get a hole where a snake will come out, click the snake. Click snake and have a look at the colored notes above. Match the snake with the same order of notes. The left over snake goes with a click into your inventory. Click the door to the left and play the ho-scene. Click the paper on the bench right side two times to unfold it. Click the grape on it. Again you will have to match pairs, this time it is about two of a kind as a statue and a drawing of a statue. Click the last one to get it into your inventory. Leave the ho-scene and the kitchen and go back to the armory room. 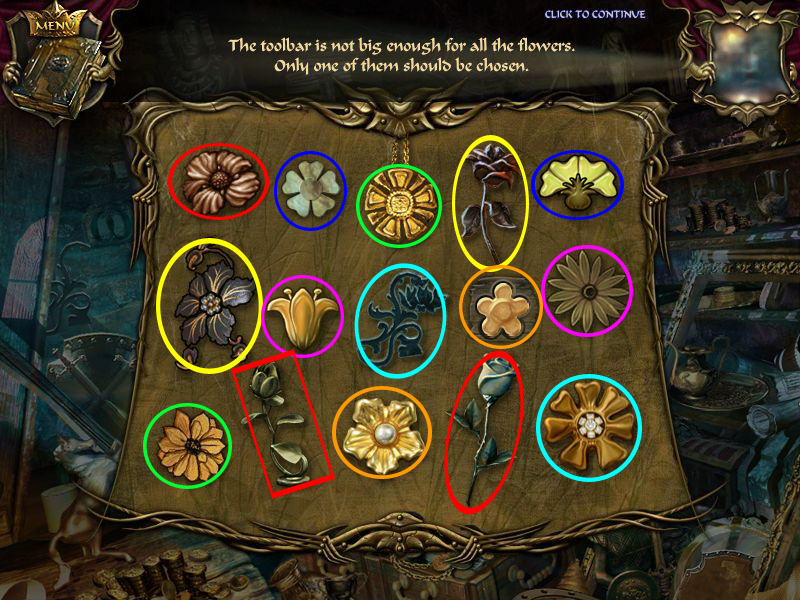 Play the ho-scene to find all flowers. For the last one get the candle from the shelf and put is into the candle holder on the table. The wax drops down, click the wax flower from the table. Another memory, match the flowers with the same order of notes. One will stay, click it into your inventory. Click the ho-scene right side and find 15 frames. 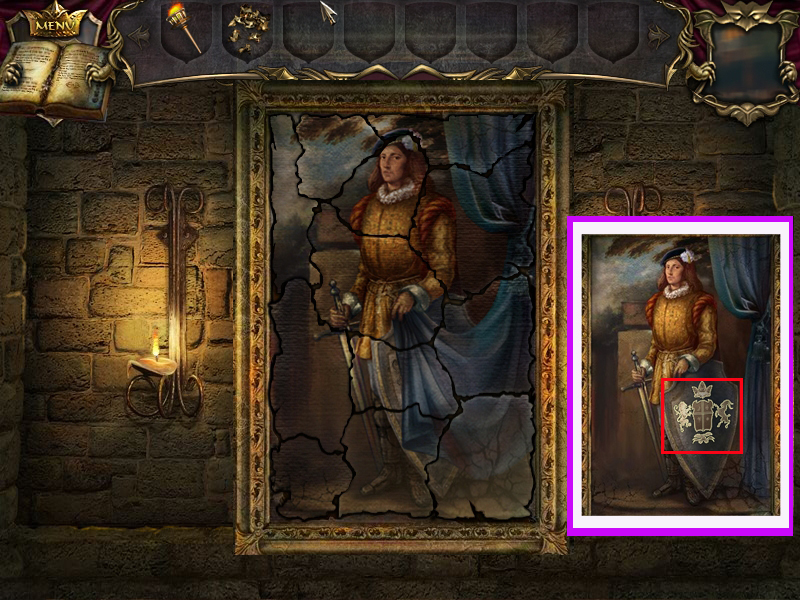 The last one has to be repaired, find the two frame parts and click then at the princess' portrait. Match the frame with the same shape. Place first snake, grapes and flower, then the frame and at last the magic sphere. Enter and find the princess. The princess is also petrified. Get the fire woods and the dustpan into your inventory. Click the chest low right corner and get out the flint. Click the fire place cover to remove it. Click the fire place and put the first the fire wood into the fire place. Use the flint to light it. Click the lever that comes out of the wall above the fireplace to flame the fire. When only coal is left, get the dustpan out of your inventory to get the coal. Click the dustpan again to get it back into your inventory. 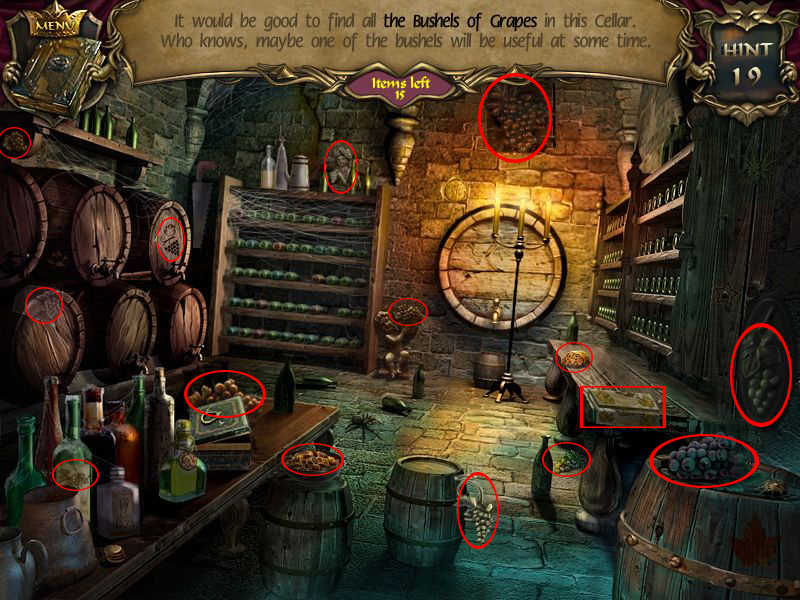 Now click the bottle collection and place the coal in the compartment below the bottles. To make the magic potion place the lightest items in the smallest beakers and the heaviest ones in the largest beakers. Use the scale on the right to determine the weight of the items. Please look at the screenshot for the solution. 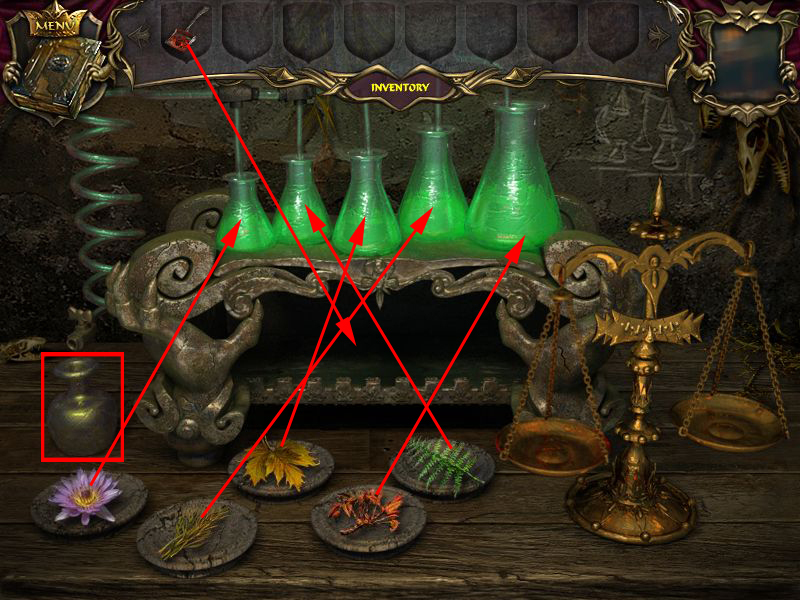 Click on the potion left side of the scene to get it into your inventory. Give the potion to the princess. She tells you about the king's second wife and gives you an amulet that will help free the prince. Enter the door behind the princess. The door closes behind you and the room is filled with water. Pick up the mallet lower left. Grab the torch upper left. Pick up the Saplings in the lower right. Get the jug in the upper right. Grab the spade on the right. Use the spade at the dirt soil left. Click the dirt on the spade and click the dirt now in the middle of the water to fill the hole. 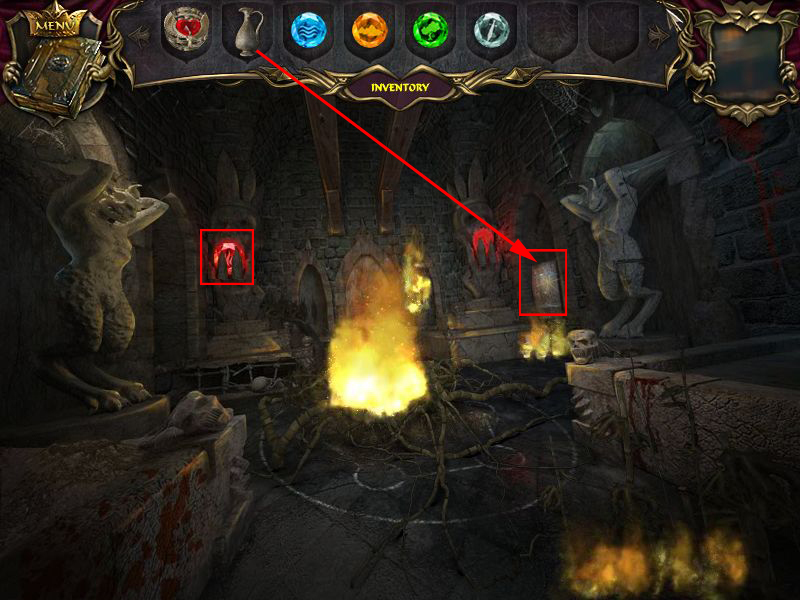 Click the blue gem at the left gargoyle. When the earthquake starts get the plant out of your inventory and place it on the soil. Get the orange gem from the gargoyle far right. Open your inventory, get the hammer and smash the skull low left in front of the door. Get the machete into your inventory and use it then to cut the roots. Get the green gem from the left gargoyle. Get the torch out of the inventory and click it in the middle of the spears. Get the white gem from the right gargoyle. Open the inventory and get out the jar. Click the barrel at the right wall to fill it with water. Pour it over the fire. 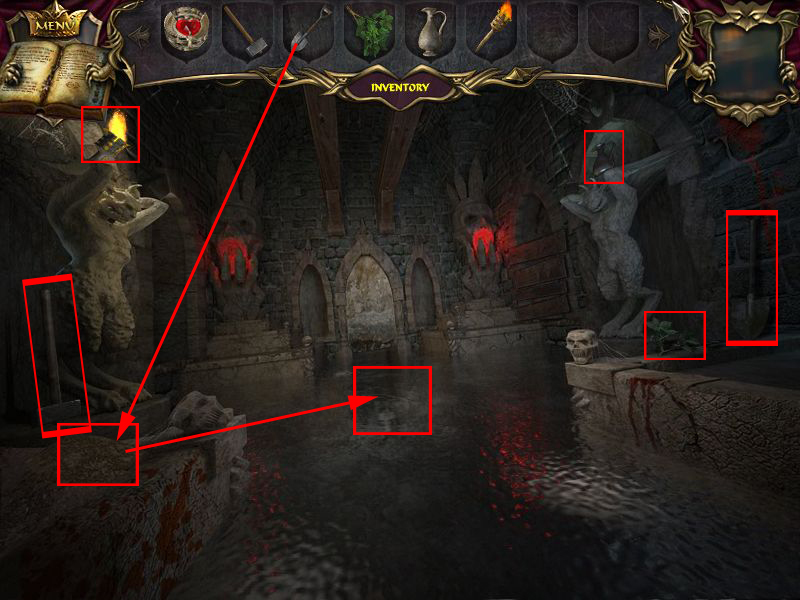 Get the red gem from the far left gargoyle. Click the middle of the room. 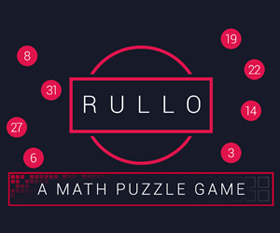 The puzzle solution depends on wher your place your gems. Open your inventory and place the gems where ever you want. 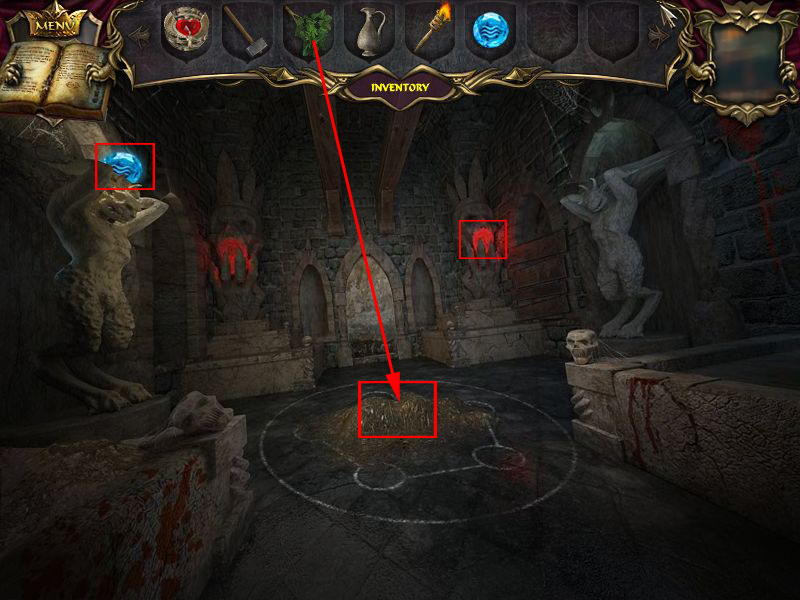 After placing them you will see symbols next to the gems as well as on the gema. Your goal is it to place each gem to its according symbol. Clicking a gem makes it go into the next empty slot. Now click the places in the following order by using the screenshot as help. The numbers do mark the slots not the gems. 4, 5, 1, 6, 4, 5, 6, 3, 2, 1, 5, 6, 3, 2, 1, 6, 3, 2, 6. 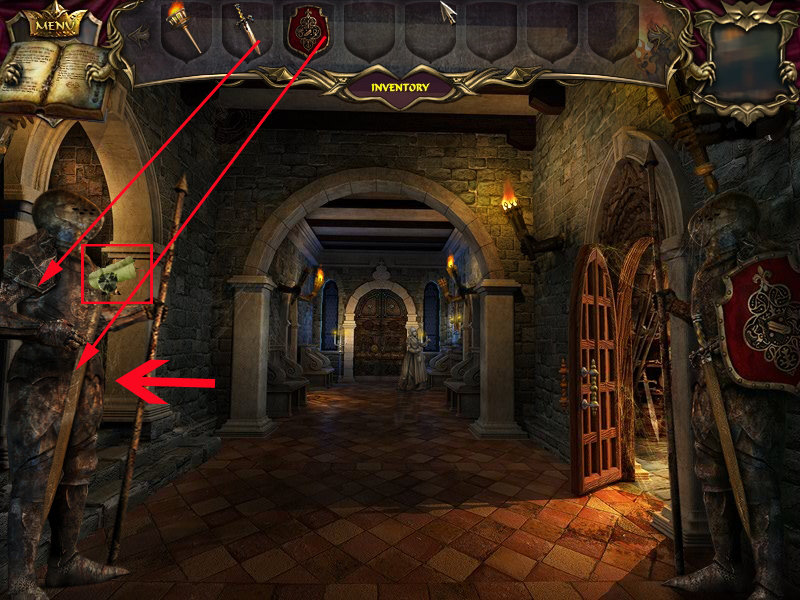 Click the mirror in the back of the scene to see the petrified prince. 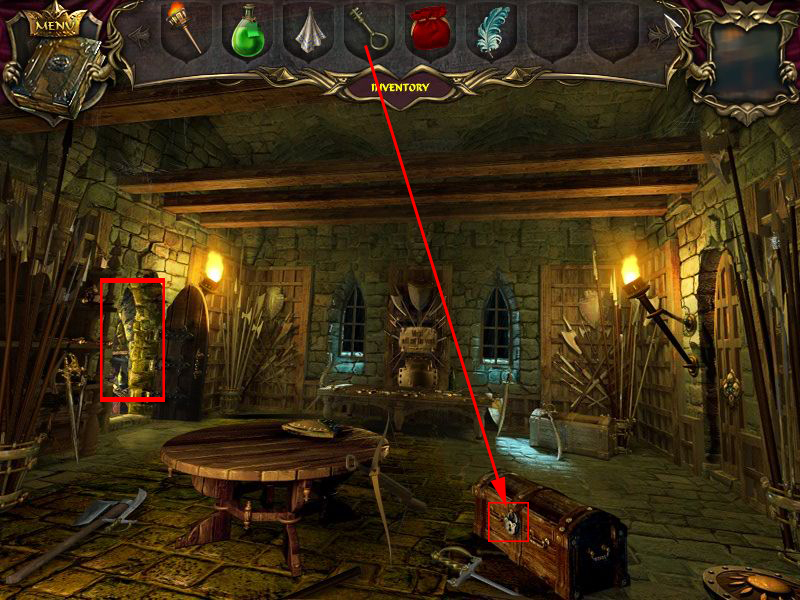 Get the amulet out of your inventory and place it in the slot above the prince. Looks cute. One big problem with these types of games is how "large" the object is - that is, I've clicked right the object in question, but it registered as a "miss" because for some reason the object doesn't fit into the "outline" or whatever decides where the object is. 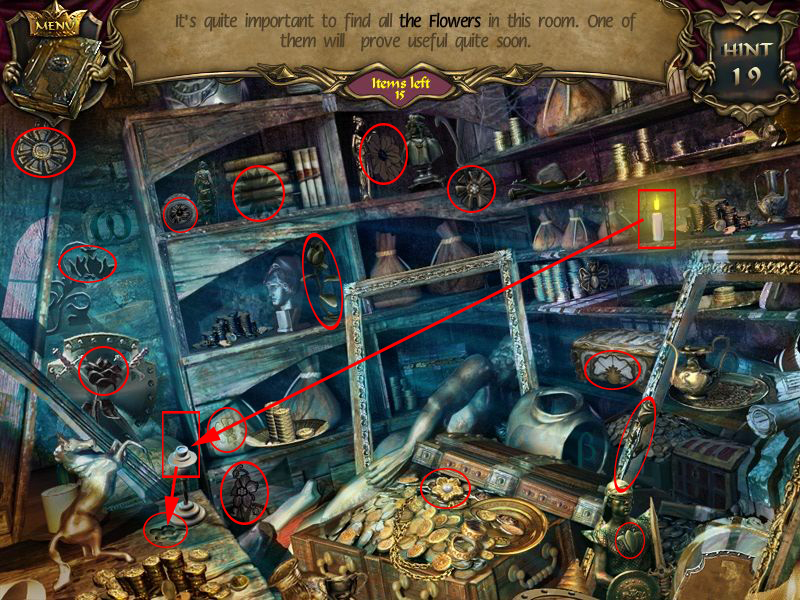 I find it in both mainstream and non-mainstream verions of hidden objects games. How did this one compare? By the way - cappuccinos came into being, as far as I know, in 1901, so you were right there, and "Ayn Rand" isn't so bad if you stick with ATLAS SHRUGGED. Hi Tabs. :) Unfortunately, Atlas Shrugged IS the only Ayn Rand book I've ever read. I'm glad to hear someone else enjoyed it, but it is so distinctly not my cuppa. As to the object hunting, I know what you're talking about, and I can't say I had that issue here. 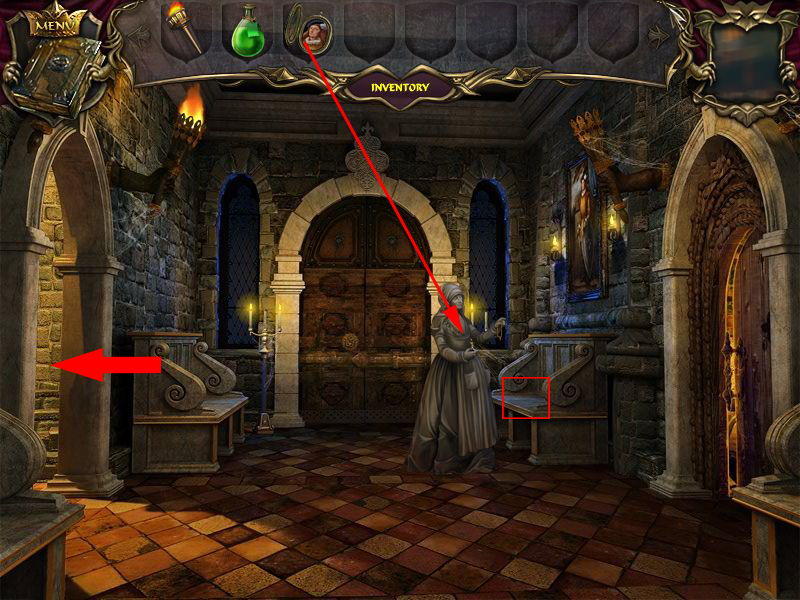 I spend through a lot of the hidden object scenes, and while you do have to click ON an item (not just near it) of course, the game seems to be particularly good at registering where you've clicked. 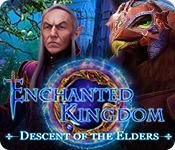 Give the demo a shot and see if you find it fussier than I did; I've admittedly been saturated with a lot of hidden object games lately, so there's every possibility I have a high level of tolerance. Unlike my relationship with Miz Rand. Is there a casual game about how bad Ayn Rand is? It was a good game, just too short. Looked pretty, objects were nicely drawn and mixed well into background. Did not have that "you miss-clicked by 1 pixel" problem either. I only skipped 1 puzzle, the one where you had to spell out the name of the king. Somehow I did not get at all how to solve it. Pushed the letters around randomly for some time and then gave up. Probably most annoying part was running through the castle looking for some item only to pick it up and run back all the way through the whole castle again. First even the navigation between rooms felt weird but I got used to it. 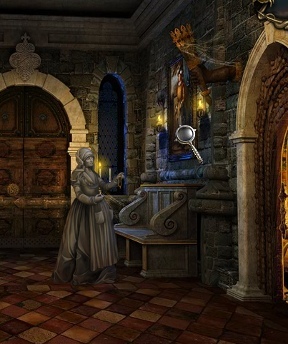 I still consider best hidden objects game "Valerie Porter and the Scarlet Scandal". Really nice game, the graphics were exquisite! It reminded me of another game (I'm racking my brains but I just can't remember the name!!) where the servants and lords of the house had been trapped, not in stone, but in broken mirrors, though. Thank you for the great clues! I was stuck at one point and was getting frustrated when I decided to search for a guide! Thanks again...very helpful. The other game about the mirrors was a really good one also! stuck on the weights. Icannot figure it out for nothing. Any clues? 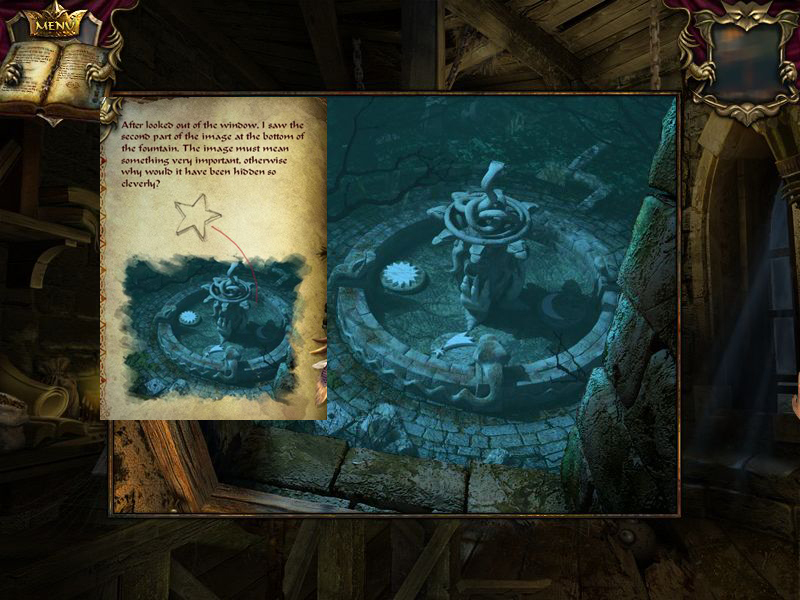 Check Chapter 2, Level 15 of the walkthrough above for the solution and a screenshot.